The human immune system involves highly complex and coordinated processes in which small proteins named cytokines play a key role. Cytokines have been implicated in the pathogenesis of a number of inflammatory and autoimmune diseases. Cytokines are therefore attractive therapeutic targets in these conditions. Anticytokine therapy for inflammatory diseases became a clinical reality with the introduction of tumor necrosis factor (TNF) inhibitors for the treatment of severe rheumatoid arthritis. Although these therapies have transformed the treatment of patients with severe inflammatory arthritis, there remain significant limiting factors: treatment failure is commonly seen in the clinic; safety concerns remain; there is uncertainty regarding the relevance of immunogenicity; the absence of biomarkers to direct therapy decisions and high drug costs limit availability in some healthcare systems. In this article, we provide an overview of the key efficacy and safety trials for currently approved treatments in rheumatoid arthritis and review the major lessons learned from a decade of use in clinical practice, focusing mainly on anti-TNF and anti–interleukin (IL)-6 agents. We also describe the clinical application of anticytokine therapies for other inflammatory diseases, particularly within the spondyloarthritis spectrum, and highlight differential responses across diseases. Finally, we report on the current state of trials for newer therapeutic targets, focusing mainly on the IL-17 and IL-23 pathways. Rheumatoid arthritis (RA) is a chronic inflammatory arthritis characterized by pain, swelling, and destruction of synovial joints, resulting in functional disability. It is a relatively common disorder, with a disease prevalence ranging from 1% in Caucasians up to 5% in certain North American indigenous groups and affecting women two to three times more than men (Spector, 1990). The chronic nature of RA results in significant health-associated direct and indirect costs estimated at €21000 ($27,000) per patient per year in the United States and €13500 ($17,400) in Europe, for a respective total of €41 ($52.90) and €45 ($58) billion annually (Furneri et al., 2012). Over the past 20 years, the treatment of RA has changed significantly. Traditional treatments consisted of glucocorticoids and nonsteroidal anti-inflammatory drugs (NSAIDs) for acute inflammation, and disease-modifying antirheumatic drugs (DMARDs), such as methotrexate (MTX), hydroxychloroquine, and sulphasalazine, for maintenance therapy. DMARDs, and MTX in particular, have been shown to reduce joint symptoms, extra-articular manifestations, and inhibit radiographic progression and are still used as first-line therapy. Nevertheless, although some RA patients respond to DMARDs alone, a large proportion of patients cannot tolerate these therapies and/or continue to have active disease despite such treatments. In addition, cumulative adverse effects, particularly with corticosteroids and NSAIDs, greatly contribute to comorbidities. Thus, there was a need for alternative therapies, which led to the introduction of biologic agents for the treatment of moderate to severe RA in the early 1990s. The signs and symptoms of RA typically result from synovitis, the inflammation of the synovial membrane within joints. A complex, interactive network of cells and cytokines are involved in the pathogenesis of RA, particularly in the recruitment, activation, and effector functions of immune cells. The synovial layer becomes neovascularized and infiltrated with macrophages and fibroblasts, in addition to an influx of B and T lymphocytes, plasma cells, mast cells, dendritic cells, and neutrophils. The hypertrophied synovial layer, also called pannus, contributes to the destruction of bone and cartilage within the joint. Interleukin-1 (IL-1) was the first cytokine reported in synovial fluid from patients with RA and was linked with cartilage degradation in vitro (Fell and Jubb, 1977; Saklatvala et al., 1983). Subsequently, tumor necrosis factor-α (TNFα) levels were also similarly shown to be correlated with cartilage destruction in vitro (Saklatvala, 1986). TNFα is a potent proinflammatory cytokine that induces several other cytokines in the proinflammatory cascade, including IL-1, IL-6, IL-8, and granulocyte macrophage-colony stimulating factor (GM-CSF) (Brennan et al., 1992) and upregulates several adhesion molecules, such as intercellular adhesion molecule (ICAM) and vascular cell adhesion molecule (VCAM) (Pober et al., 1986; Osborn et al., 1989). Structural erosions in RA occur along the interface of pannus (hypertrophied synovial cell layer) and cartilage, in an area densely populated with TNFα-producing cells (Deleuran et al., 1992). Subsequently, it was shown that neutralization of TNFα, using anti-TNF antibodies, in mouse models of arthritis resulted in a significant decrease in joint swelling and structural erosions (Williams et al., 1992). The seminal preclinical study suggesting the utility of blocking TNFα in humans with RA was the demonstration that TNFα antibodies significantly reduced the high IL-1 production by RA synovial cell cultures (Brennan et al., 1989). The inhibition of inflammatory cytokines, and TNFα in particular, therefore became the major focus of clinical research in RA in the 1990s, which has continued to this day. The first open-label trial using a TNF blocking agent was conducted in the United Kingdom in 1992, in which 20 patients with RA were given infliximab, a chimeric antibody specific for TNFα, resulting in a significant decrease in the signs and symptoms of RA, accompanied by a decrease in inflammatory markers (Elliott et al., 1993). The early promise of anti-TNF therapy in RA was confirmed in several large multicenter studies. These agents have revolutionized the outcomes for patients with RA and yielded important insights into the pathophysiology of this condition, in addition to achieving blockbuster status and generating huge profits for the pharmaceutical industry. Since the introduction of infliximab, further anti-TNF agents and other cytokine inhibitors have been developed and reached the clinic. Although these agents have largely been developed and tested in RA, their use has extended to other chronic inflammatory conditions, occasionally with unexpected and apparently divergent results. Herein, we review the lessons learned from the use of cytokine inhibitors in RA over the past two decades and outline the current status of these and newer agents for related chronic inflammatory conditions. 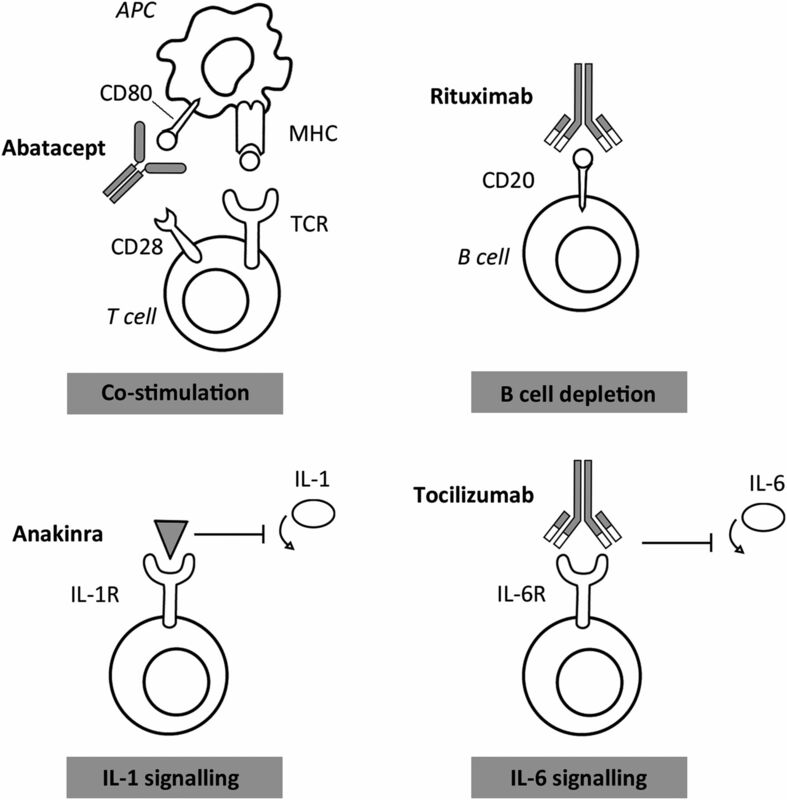 There are several biologic agents available for the treatment of RA [e.g., rituximab (CD20), abatacept (CTLA-4)] that do not directly target cytokines and that are not included in this review. Drugs that target the cytokines TNFα, IL-6, and IL-1 are currently licensed for treatment of RA. The drug dosages and relevant key phase III studies in RA are shown in Tables 1 and 2, respectively. There are currently five TNF inhibitors licensed for the treatment of RA. Of these, three are full-length monoclonal antibodies (infliximab, adalimumab, and golimumab), one is a humanized fragment antigen-binding fragment (Fab) conjugated to polyethylene glycol (certolizumab), and one is a soluble fusion protein (etanercept) (Fig. 1). Anti-TNF agents approved for the treatment of rheumatoid arthritis. Schematic of the structures of the anti-TNF agents approved for RA. Etanercept is a fusion protein of two TNF receptor extracellular domains and the Fc region of IgG1. Certolizumab is a PEGylated humanized Fab fragment with no Fc region. Infliximab is a chimeric monoclonal antibody with a murine variable region. Adalimumab and golimumab are fully human monoclonal antibodies. Fab, fragment antigen binding; Fc, fragment crystallizable; PEG, polyethylene glycol. The efficacy outcomes for clinical trials in RA are based on the American College of Rheumatology (ACR) core set of seven disease activity outcomes, namely swollen joint count, tender joint count, physician’s assessment of disease activity, patient’s assessment of disease activity, patient’s assessment of pain, patient’s assessment of physical function, and levels of acute-phase reactant [either C-reactive protein (CRP) level or erythrocyte sedimentation rate (ESR)] (Felson et al., 1993). The core set of measures were subsequently used to develop the ACR response criteria, representing single measures of improvement (Felson et al., 1995). An ACR20 response is defined as at least 20% improvement in both tender and swollen joint counts plus at least 20% improvement in three of the other five core sets listed above. The ACR20 is the current accepted primary outcome measure in studies of established RA and was the primary outcome for all the key phase III TNF inhibitor studies. The ACR20 is also the current measure used by regulators to evaluate new treatments for RA. The ACR20 response measures improvement in individual patients rather than the mean improvement in groups of treated patients and is generally reported as the percentage of participants who achieve at least this level of improvement. As therapies improved, trials began to incorporate higher thresholds for improvement, such as the ACR50 and the ACR70, representing 50 and 70% improvement in the above core measures, respectively. The key phase III studies for the anti-TNF agents licensed for the treatment of RA are shown in Table 2. These studies were all performed in patients with active RA who were inadequate responders (IRs) to MTX (MTX-IR) (Maini et al., 1999; Moreland et al., 1999; Weinblatt et al., 2003; Keystone et al., 2008, 2009). The primary outcome (ACR20) was achieved in all the key phase III TNF inhibitor studies, although the timing of the primary outcome varied, which accounts for the higher placebo responses seen in the shorter studies. A striking feature of these and subsequent studies is the similarity in response rates between the various agents. In RA patients who are MTX-IR, the ACR20, ACR50, and ACR70 response criteria were achieved at week 24 in approximately 60, 40, and 20% of patients receiving an active TNF inhibitor, respectively. Although these results are significantly superior to previous DMARD therapies and the placebo arms, particularly considering these patients are MTX-IR, there is clearly still a large residual unmet need. A considerable proportion of patients (∼40%) do not achieve even 20% response rate, whereas only a small minority of patients achieve remission in the short term. A meta-analysis by Nam et al. (2010) used the 6-month ACR response rates from 16 trials comparing various biologics with a combination of placebo with MTX to calculate that the numbers needed to treat to achieve ACR20, ACR50, and ACR70 responses were 3.2, 4.2, and 7.7, respectively. Subsequent longer-term studies and systematic reviews have also indicated that the anti-TNF agents are effective in reducing the progression of erosive damage as assessed by X-ray (Graudal and Jurgens, 2010) and in improving quality of life as measured by health assessment questionnaire (HAQ) scores (Navarro-Sarabia et al., 2005; Chen et al., 2006). 2. Coprescription with Methotrexate or Other Disease-Modifying Antirheumatic Drugs. Infliximab is licensed for the treatment of RA in combination with MTX, whereas the other TNF inhibitors are licensed for use as monotherapy or in combination with MTX. Several large studies that included anti-TNF therapy in combination with MTX compared with anti-TNF monotherapy have indicated superiority for combination therapy in terms of clinical response, radiographic progression, and function (Klareskog et al., 2004; Breedveld et al., 2006; Smolen et al., 2009). The updated systematic review by Nam et al. (2014) used to inform the 2013 update of the European League against Rheumatism (EULAR) guidelines for the management of RA concluded that although there was some additional evidence for the use of biologic monotherapy, a biologic in combination with MTX is more efficacious than the same biologic agent alone. In addition, there is also accumulating evidence from trial and registry data that the coprescription of MTX with biologics improves drug survival and persistence with the therapy (Blum et al., 2011; Soliman et al., 2011; Iannone et al., 2012), so combination therapy is now recommended in most treatment guidelines for the use of TNF inhibitors in RA. Patients with RA are already at increased risk of serious infections and malignancy (Gridley et al., 1993; Doran et al., 2002), so when anti-TNF agents were first used in the clinic, there were particular concerns about whether they would increase these events. Early meta-analysis of serious infections and malignancies in anti-TNF clinical trials (Bongartz et al., 2006; Leombruno et al., 2009) yielded conflicting results, reflecting differences in classification and analysis. Similarly, the lack of standardization in the methodologies of observational studies and registries also demands a degree of caution when assessing and comparing their results (Solomon et al., 2012). Observational registry data incorporating large numbers of RA patients, indicated that those receiving anti-TNF agents had 42 serious infections per 1000 patient years, compared with 32 per 1000 patient-years in those receiving conventional DMARDs, with an adjusted hazard ratio of 1.2 (95% CI 1.1–1.5) for serious infections with anti-TNF agents (Galloway et al., 2011a). The risk of serious infection in this study was highest in the first 6 months after starting the TNF inhibitors. Advanced age, steroid use, and smoking increased the risk in both groups. The adjusted incidence rate ratio for infections was 1.52 (95% CI 1.30–1.78) for TNF inhibitors and 1.30 (95% CI 1.12–1.50) for MTX compared with other DMARDs in the North American CORRONA (Consortium of Rheumatology Researchers of North America) registry (Greenberg et al., 2010), although hospitalizations for serious infections were not increased in a different U.S. dataset (Grijalva et al., 2011). Registry data have suggested an increased risk of soft tissue infection and septic arthritis in RA patients receiving biologics (Dixon et al., 2006; Galloway et al., 2011b). Increased reactivation of tuberculosis (TB) was first reported with infliximab (Keane et al., 2001) and is now a well established adverse effect of anti-TNF therapy, having been observed in trials and registries. Standard clinical practice therefore includes routine screening for TB before starting these therapies. TNF is now recognized as a key cytokine in maintaining TB granulomas (Bean et al., 1999; Algood et al., 2005), which are disrupted by anti-TNF therapy, resulting in reactivation and dissemination of the bacilli, often resulting in extrapulmonary disease (Dixon et al., 2010). Registry data have shown that the rate of TB reactivation was 3–4 times higher for adalimumab and infliximab than etanercept (Dixon et al., 2010). The reasons for this difference between TNF inhibitors are covered elsewhere in this review. Many other infectious diseases have been reported in association with TNF inhibitors. Reactivation of viral infections, particularly herpes zoster (Strangfeld et al., 2009), hepatitis B (Tanaka and Urata, 2012), and hepatitis C (Ferri et al., 2008), remains a concern, and the long-term safety of biologics in patients with these chronic viral infections remains unclear. Although one study using registry data suggested an increased risk of shingles in the anti-TNF treated RA cohort (Galloway et al., 2013), there was no association between the initiation of anti-TNF therapy and shingles in a study using health insurance data (Winthrop et al., 2013). Although a higher risk of zoster infection with TNF inhibition cannot be excluded, a recent systematic literature review has not indicated a statistically significant risk when adjusted for drop-outs (Ramiro et al., 2014). Assessment of the risk of cancers in RA patients receiving biologics is methodologically challenging because the incidence of cancers, particularly lymphoma, is already increased in patients with RA, particularly those with aggressive disease who are the patients most likely to be receiving biologic therapies (Franklin et al., 2005; Mercer et al., 2013). Data from registries and meta-analyses have thus far not suggested any further significant increase in the risk of lymphomas with TNF inhibitors above the increased risk that is already seen in RA patients receiving conventional DMARDs (Wolfe and Michaud, 2007; Askling et al., 2009; Mariette et al., 2011; Ramiro et al., 2014). Similarly, no increased risk of solid tumors with TNF inhibitors has been reported (Wolfe and Michaud, 2007; Strangfeld et al., 2010; Amari et al., 2011; Mariette et al., 2012). There are only data regarding the risk of invasive melanoma with TNF inhibitors from a prospective population-based cohort study in Sweden that reported an adjusted hazard ratio of 1.5 (95% CI, 1.0–2.2) in RA patients treated with TNF inhibitors, compared with the normal population and patients who had not received these agents (Raaschou et al., 2013). The risk of melanoma may therefore be increased in patients on TNF inhibitors, but the data come from a single study and need to be confirmed (Ramiro et al., 2014). Despite the reassuring data for other cancers, ongoing vigilance and monitoring is warranted because these may develop slowly over many years. 4. Differences between the Individual Tumor Necrosis Factor Inhibitors. Although the phase III clinical studies suggest that the five currently available TNF inhibitors are very similar in terms of their efficacy response rates and adverse event profiles, there do appear to be important differences between these agents that may have clinical implications. In the absence of head-to-head randomized controlled trials (RCT) of the various TNF inhibitors, data to support differences between these agents have arisen largely from drug registries and clinical experience. The majority of this data therefore relates to infliximab, adalimumab, and etanercept because these have been used in clinical practice for longer than the more recently licensed golimumab and certolizumab. a. Differences in infections and tuberculosis. Registry data suggest that etanercept is associated with longer drug survival rates than adalimumab or infliximab, which may reflect increased efficacy and/or reduced adverse events (Hetland et al., 2010). Although all anti-TNF agents are associated with reactivation of TB (described above), this risk is higher with the monoclonal antibodies than etanercept (Wallis et al., 2004; Tubach et al., 2009; Dixon et al., 2010). Differences in drug binding kinetics, permeability, and bioavailability in granulomatous tissue account for this differential risk (Furst et al., 2006; Fallahi-Sichani et al., 2012), which also has implications for the use of these agents in other granulomatous conditions, such as Crohn’s disease (covered elsewhere). It is now standard practice to routinely screen patients for TB, and treat with antituberculosis chemoprophylaxis where appropriate, before starting anti-TNF therapy. Differences between TNF inhibitors in other opportunistic infections have also been reported in some registry reports (Salmon-Ceron et al., 2011), but no significant difference in serious infections was observed in other studies (Galloway et al., 2011a). Current registry data do not indicate that these purported differences between TNF inhibitors translate into significant differences in overall mortality (Simard et al., 2012). b. Differences in mechanisms of action. Although all the current anti-TNF agents bind both soluble TNF and membrane-associated TNF, only etanercept binds lymphotoxin. It is unclear whether neutralization of lymphotoxin provides etanercept with any additional therapeutic benefits, although there is a single case report suggesting this may play a role in at least some patients with RA (Buch et al., 2004). In addition to blocking TNF-mediated signaling, the binding to membrane-bound TNF can result in agonist actions via reverse signaling. The exact molecular pathways activated by reverse signaling remain unclear, but include apoptosis, cytokine suppression, and cell activation (Vudattu et al., 2005; Juhasz et al., 2013). Although all five TNF inhibitors bind membrane TNF, they differ in their ability to activate reverse signaling. Specifically, infliximab, but not etanercept, suppressed lipopolysaccharide-induced proinflammatory cytokine production in a human monocyte cell line (Kirchner et al., 2004) and induced cell cycle arrest and apoptosis in a T-cell line (Mitoma et al., 2005). This difference in membrane TNF reverse signaling has been proposed as an important mechanism for why etanercept, unlike the monoclonal antibodies, is not effective in Crohn’s disease (Perrier et al., 2013), although tissue drug concentrations may also play a role. The various anti-TNF agents also differ in how they form complexes with TNF (Tracey et al., 2008), engage Fc receptor (Tracey et al., 2008), induce apoptosis (Nesbitt et al., 2007), and induce antibody-dependent cell-mediated cytotoxicity (Nesbitt et al., 2007; Taylor, 2010), although it is still unclear how and even whether these factors contribute to clinical efficacy and safety. All five anti-TNF agents are associated with immunogenicity and the development of anti-drug antibodies. These anti-drug antibodies could have potential repercussions on the efficacy and safety of these agents, but their clinical relevance is not yet fully understood and not all antibodies are neutralizing. Assessment and comparison is hampered by the lack of standardization of the antibody assays and their reporting. It is, however, clear that the TNF inhibitors differ in their immunogenicity, which is influenced by factors that include the structure of the drug; route, dose, and schedule of administration; concomitant medications; underlying disease; age; immune status; and genetics (Garces et al., 2013). Infliximab is the most immunogenic, consistent with its chimeric structure containing 25% murine sequences, leading to development of human anti-chimeric antibodies (Atzeni et al., 2013). The reported prevalence of anti-infliximab antibodies varies greatly depending on the assay and timing, but appears to be around 30% in RA (Pascual-Salcedo et al., 2011) and may be as high as 61% in Crohn’s disease (Baert et al., 2003), with this latter high prevalence most likely due to the episodic dosing schedule used in Crohn’s. Although the development of anti-infliximab antibodies is associated with reduced efficacy of infliximab, these antibodies could also be detected in a significant proportion of patients who were classified as moderate or good infliximab responders (Pascual-Salcedo et al., 2011). This limits their utility in an individual patient, and measurement of anti-drug antibodies is therefore not currently part of standard clinical practice. Anti-infliximab antibodies are also associated with acute infusion reactions (Pascual-Salcedo et al., 2011; Atzeni et al., 2013) but not delayed hypersensitivity reactions (Chaparro et al., 2012). As is the case with efficacy, anti-infliximab antibodies are not universally associated with acute infusion reactions. Despite its humanized structure, adalimumab antibodies have been detected in 28% of RA patients in a 3-year follow-up study, with two-thirds of these patients developing anti-adalimumab antibodies within the first 28 weeks of treatment (Bartelds et al., 2011). Anti-adalimumab antibody development was associated with lower adalimumab concentrations and reduced clinical response to adalimumab, but again this was not universal with anti-adalimumab antibodies detected in 4% of patients with sustained remission (Bartelds et al., 2011). There is to date only limited, short-term data regarding antibody production with certolizumab and golimumab. Etanercept appears to be the least immunogenic of the current anti-TNF agents. In a 5-year extension study to evaluate the long-term efficacy and safety of etanercept in RA, Klareskog et al. (2011) found that anti-etanercept antibodies were present in <5% of patients and that all antibodies were non-neutralizing (Klareskog et al., 2011). There was also no statistically significant relationship between autoantibody titers and adverse clinical events in this study. Several studies indicated that the presence of antibodies against one TNF inhibitor does not preclude the use of another (van der Bijl et al., 2008; Bartelds et al., 2010; Jamnitski et al., 2011). In fact, the presence of anti-infliximab antibodies was associated with better response after switch to adalimumab or etanercept. 6. Switching between Tumor Necrosis Factor Inhibitors. Registry data demonstrate that after 3–4 years, up to 50% of patients will have discontinued a previously effective anti-TNF agent either because of adverse effects or lack of efficacy (Du Pan et al., 2009; Hetland et al., 2010; Soliman et al., 2011). Provided there is no contraindication to further biologic therapy, the options for these patients are to either switch to an alternative TNF inhibitor or to change to a different class of biologic agent. There are currently limited trial data to inform this decision, so this issue has been addressed mainly using observational data from registries and similar studies. These data suggest that sequential switching to an alternative TNF inhibitor will reduce disease activity and improve functional scores, but that response rates, probability of response, and drug survival are all lower than with first anti-TNF agent (Gomez-Reino and Carmona, 2006; Hyrich et al., 2007; Virkki et al., 2011; Chatzidionysiou et al., 2014). The best results were seen with switches from infliximab to etanercept for reasons of secondary inefficacy (Chatzidionysiou et al., 2014). Economic analysis, however, has suggested sequential use of TNF inhibitors may not be a cost-effective strategy (Malottki et al., 2011; Sullivan et al., 2013). There is accumulating data emerging to suggest that after inadequate response to anti-TNF therapy, response and drug retention rates are better in patients who change to a non-TNF biologic agent, with most of the current data relating to anti-CD20 therapy with rituximab (Finckh et al., 2010; Du Pan et al., 2012; Gomez-Reino et al., 2012; Kekow et al., 2012; Chatzidionysiou and van Vollenhoven, 2013). This was recently confirmed in a prospective observational trial that demonstrated that after discontinuation of an initial TNF inhibitor, switching to rituximab is associated with significantly improved clinical effectiveness compared with switching to a second TNF inhibitor (Emery et al., 2014). This difference was most marked in seropositive patients and in those switched due to inefficacy. 7. Predictors of Response to Tumor Necrosis Factor Inhibitors. The aspiration of true personalized medicine for use of TNF inhibitors in RA is not yet a reality. The main attempts at predicting response to anti-TNF agents have involved evaluating demographic and clinical characteristics, serological biomarkers, and pharmacogenomics studies. Registry data have consistently shown that smokers have a lower response rate and are less likely to achieve remission with anti-TNF therapy (Hyrich et al., 2006; Hetland et al., 2010; Soderlin et al., 2012), whereas obesity may prevent the beneficial effects of TNF inhibitors on RA-induced insulin resistance (Stavropoulos-Kalinoglou et al., 2012). Baseline level of disability has been identified as a poor prognostic factor for response, whereas concurrent MTX was associated with improved response (Hyrich et al., 2006; Hetland et al., 2010; Kristensen et al., 2008). The DANBIO (Danish Biologics Database) register also suggested that older age and use of oral prednisolone are predictors of poor response (Hetland et al., 2010), but this was not seen in other registry data (Hyrich et al., 2006). An increasing number of single nucleotide polymorphisms associated with clinical response to TNF inhibitors are being identified (Cui et al., 2013; Davila-Fajardo et al., 2014). These require extensive further validation and are not currently of clinical utility. Patents for many of the early biologics used in the treatment of chronic inflammatory disease are now beginning to expire, resulting in the development of biosimilars, with the potential for significant savings for healthcare funders and increased patient access. The European Medicines Agency (EMA) describes a “biosimilar” medicine (also known as “follow-on biologic” in the United States and “subsequent entry biologic” in Canada) as a biologic medicine that is similar to another biologic medicine (“innovator”) that has already been authorized for use. In practical terms, biosimilars are licensed subsequent versions of innovator biologic products made by a different sponsor after patent and exclusivity expiry of the innovator product. Biosimilars require proof of similarity of effect, but not de novo efficacy. The EMA and U.S. Food and Drug Administration (FDA) have produced guidelines describing the specific regulatory process for biosimilars that include the need for head-to-head comparison trials with the original product and provide the opportunity for extrapolation of indications (http://www.ema.europa.eu/ema/index.jsp?curl=pages/special_topics/document_listing/document_listing_000318.jsp; http://www.fda.gov/drugs/developmentapprovalprocess/howdrugsaredevelopedandapproved/approvalapplications/therapeuticbiologicapplications/biosimilars/default.htm), although several other countries have less robust regulation of biosimilars. A full review of biosimilars is outside the scope of this paper, so readers are referred to the regulators’ websites and specific reviews on this topic. However, it should be noted that biologics are complex macromolecules, with tertiary and quaternary structures, which undergo significant post-translational modification (e.g., glycosylation). Therefore, although the molecules are “similar,” these post-translational differences may affect the immunogenicity and, therefore, the safety and sustained efficacy of these products [see example of biosimilar epoietins that led to pure red cell aplasia (Casadevall et al., 2002)]. Furthermore, the glycosylation profile of several current licensed “innovator” biologics has also changed over time as a result of changes in manufacturing processes, resulting in two glycoforms of Enbrel (etanercept) on the market (Schiestl et al., 2011). The first clinical trials to demonstrate unequivocal efficacy of a biosimilar for the treatment of chronic inflammatory rheumatic conditions were published in 2013. The PLANETRA (Programme Evaluating the Autoimmune Disease Investigational Drug CT-P13 in RA Patients) and PLANETAS (Programme Evaluating the Autoimmune Disease Investigational Drug CT-P13 in AS Patients) studies demonstrated equivalent efficacy of an infliximab biosimilar (CT-P13) with innovator infliximab in RA and ankylosing spondylitis (AS), respectively (Park et al., 2013; Yoo et al., 2013). Based on these study results, the EMA granted CT-P13 two marketing authorizations (for Inflectra [Hospira UK Limited, Royal Leamington Spa, UK] and Remsima [Celltrion, Incheon City, Republic of Korea]) in September 2013, thereby becoming Europe’s first biosimilar monoclonal antibody therapy (http://www.ema.europa.eu/ema/index.jsp?curl=pages/medicines/human/medicines/002778/human_med_001677.jsp&mid=WC0b01ac058001d124; http://www.ema.europa.eu/ema/index.jsp?curl=pages/medicines/human/medicines/002576/human_med_001682.jsp&mid=WC0b01ac058001d124). Although the PLANET studies did not raise any new safety signals, numbers were not sufficient to exclude low level signals, so the marketing authorization includes a risk management plan (including long-term safety and immunogenicity and the effect of switching from infliximab). In keeping with indication extrapolation, both authorizations were extended beyond RA and AS to include Crohn’s disease, ulcerative colitis, psoriatic arthritis, and psoriasis. Although the United States is yet to license any biosimilars, the European launch of these infliximab biosimilars is anticipated in 2015 when the European patent for infliximab expires. The exact role and positioning of biosimilars in the armamentarium for the treatment of chronic inflammatory disease remains to be seen and will ultimately be influenced by cost, demonstration of sustained efficacy, and long-term safety. IL-6 is another cytokine that has successfully been targeted therapeutically in RA. Tocilizumab, a humanized monoclonal antibody targeting the IL-6 receptor (IL-6R) α protein in its soluble and membrane-bound forms, is currently the only anti–IL-6 agent licensed for the treatment of RA. A schematic of the mechanism of action of tocilizumab is shown in Fig. 2 and compared with other non-TNF biologics approved for the treatment of RA. Non-TNF biologic agents approved for the treatment of rheumatoid arthritis. Schematic outlining the main binding sites and mechanisms of the biologic agents other than TNF inhibitors approved for the treatment of RA. Abatacept is a fusion protein of the extracellular domain of CTLA-4 and the Fc region of IgG1. Rituximab is a chimeric monoclonal antibody targeting the protein CD20. Anakinra is a recombinant version of human IL-1Ra. Tocilizumab is a humanized monoclonal antibody targeting the IL-6 receptor α protein. APC, antigen presenting cell; MHC, major histocompatibility complex; CTLA-4, cytotoxic T-lymphocyte-associated protein 4; TCR, T-cell receptor. An extensive phase III program has demonstrated tocilizumab’s efficacy in RA in DMARD-naive patients (Jones et al., 2010), DMARD-IR (Nishimoto et al., 2007; Genovese et al., 2008; Smolen et al., 2008; Kremer et al., 2011; Yazici et al., 2012), and TNF-IR (Emery et al., 2008; Bykerk et al., 2012; Weinblatt et al., 2013). At a dose of 8 mg/kg in combination with conventional DMARDs such as MTX, tocilizumab led to ACR20 responses of approximately 60% at 24 weeks (Table 2) (Genovese et al., 2008; Smolen et al., 2008). Onset of action was rapid, with falls in mean tender and swollen joint counts observed after 4 weeks (Burmester et al., 2011). Improvements in HAQ functional scores were observed but must be interpreted in the light of high placebo response levels (Emery et al., 2008; Genovese et al., 2008; Smolen et al., 2008; Kremer et al., 2011; Yazici et al., 2012). The efficacy response rates are maintained in long-term follow-up studies of up to 5 years (Nishimoto et al., 2009; Genovese et al., 2013b). Efficacy rates in TNF-IR patients were less impressive than those for TNF inhibitor–naive patients but remained superior to placebo (Emery et al., 2008; Burmester et al., 2011; Bykerk et al., 2012). In addition to clinical efficacy, several studies have demonstrated the ability of tocilizumab to reduce radiographic progression (Nishimoto et al., 2007; Kremer et al., 2011; Dougados et al., 2013). Radiographic progression is reduced with tocilizumab even in the presence of persistent synovitis or high disease activity (Smolen et al., 2012), a feature also described with anti-TNF agents and rituximab (Landewe et al., 2006; Emery et al., 2009; Smolen et al., 2009; Aletaha et al., 2013). 2. Monotherapy or Combination Tocilizumab Therapy? In contrast to the other biologic agents licensed for the treatment of RA, tocilizumab appears effective as monotherapy, with only small additional benefit attained from combination with MTX. Three RCTs (one of which included patients who had failed anti-TNF therapy) failed to demonstrate superiority for ACR20 response rates of tocilizumab combination with DMARDs over tocilizumab monotherapy at 8 mg/kg (Maini et al., 2006; Dougados et al., 2013; Weinblatt et al., 2013). The trial by Maini et al. (2006), however, did suggest superiority of combination therapy for ACR70 (37 versus 16%) and DAS28 (disease activity score in 28 joints) remission (34 versus 17%), suggesting that concomitant DMARD use may be appropriate to obtain good disease control or remission in a proportion of patients. This stands in contrast to studies of anti-TNF therapy that have consistently shown significant improvement in efficacy when these agents are used in combination with MTX and that have struggled to demonstrate superiority of anti-TNF agents over DMARDs when used as monotherapy (Breedveld et al., 2006). Recently this contrast was brought into focus by the ADACTA (Adalimumab Actemra) study, a head-to-head comparison of tocilizumab 8 mg/kg monotherapy against adalimumab 40 mg monotherapy fortnightly that demonstrated superiority of tocilizumab monotherapy for ACR50 (47 versus 28%), EULAR response (78 versus 55%), and DAS28 remission rates (40 versus 11%) (Gabay et al., 2013a). These findings were not significantly altered by use of scoring systems that did not rely on the acute phase response (Gabay et al., 2013b). Several studies also demonstrated that the ability of tocilizumab monotherapy to reduce radiographic progression (Nishimoto et al., 2007; Dougados et al., 2013). It should be noted that current treatment guidelines for RA recommend use of TNF inhibitors with MTX or other DMARDs, although it has been reported that up to 30% of RA patients receiving TNF inhibitors in the U.S. are receiving these as monotherapy without DMARDs (Lee et al., 2009). 3. Intravenous or Subcutaneous Tocilizumab Delivery? Tocilizumab was initially licensed for intravenous delivery. Two recent RCTs demonstrated efficacy of subcutaneous tocilizumab 162 mg weekly as both monotherapy (Ogata et al., 2014) and in combination with DMARDs (Burmester et al., 2014). In both studies, subcutaneous delivery was not statistically inferior to 8 mg/kg i.v. every 4 weeks, with ACR20 rates of 79 versus 89% as monotherapy and 69 versus 73% in combination with DMARDs, respectively. 4. Treatment Cessation and Drug Holidays for Tocilizumab. The DREAM (Drug Free Remission/Low Disease Activity after Cessation of Tocilizumab [Actemra] Monotherapy) study followed 187 participants from phase III RCTs of tocilizumab monotherapy who were in clinical remission (DAS28-ESR < 2.6) or low disease activity state (LDA; DAS28-ESR < 3.2) at cessation of study treatment (Nishimoto et al., 2014a). One year after tocilizumab cessation, the proportions of patients in LDA, DAS28-ESR remission, or ACR/EULAR remission were 13.3, 9, and 7.5%, respectively. A follow-up study, RESTORE (Retreatment Efficacy and Safety of Tocilizumab in Patients with Rheumatoid Arthritis in Recurrence), demonstrated that retreating these patients with tocilizumab (as monotherapy or combined with DMARDs) led to 89% achieving DAS28-ESR remission and 43.9% achieving ACR/EULAR remission criteria by 12 weeks (Nishimoto et al., 2014b). No serious allergic reactions were observed on retreatment, and only one patient was found to have antitocilizumab antibodies. The most common adverse event attributed to tocilizumab is infection, with serious infection rates of 47 per 1000 patient-years reported in a meta-analysis of pooled clinical trial data (Schiff et al., 2011). Similar rates were reported in phase IV postmarketing studies (Nishimoto et al., 2009; Koike et al., 2011; Takeuchi et al., 2011; Yamanaka et al., 2011). These figures are comparable with those seen with TNF inhibitors. Bacterial pneumonia was the most commonly reported infection. The meta-analysis detected seven cases of TB in 1870 patients treated with 8 mg/kg tocilizumab (Schiff et al., 2011), with pretreatment screening for TB recommended in treatment guidelines. In pooled clinical trial data, tocilizumab increased mean hemoglobin by around 1 g/dl within 6 weeks (IL-6 is recognized as the main driver of anemia of chronic disease) but was associated with dose-related falls in mean neutrophil and platelet counts (Schiff et al., 2011). Liver transaminase level increases were similar in patients treated with MTX monotherapy and tocilizumab monotherapy. The tocilizumab RCTs universally report elevation, then stabilization, of total cholesterol, high-density lipoprotein cholesterol and low-density lipoprotein cholesterol in the weeks after initiation of tocilizumab. The relevance and impact of these changes on cardiovascular disease risk is still unclear (Robertson et al., 2013). Data from existing tocilizumab trials do not indicate excess cardiovascular disease risk, although event numbers were small and follow up short (Schiff et al., 2011), so longer-term studies are required. A study with cardiovascular end points comparing tocilizumab and etanercept is currently underway (http://clinicaltrials.gov/show/NCT01331837). c. Cancer and other adverse events. Other reported adverse events include bowel perforation, predominantly in patients with previous diverticulitis or on concomitant corticosteroid or NSAID therapy (Curtis et al., 2012), and one reported case of leukoencephalopathy (JC virus–negative) (Kobayashi et al., 2009). There is currently insufficient evidence to advise on the safety of tocilizumab during pregnancy (Ostensen and Forger, 2011); the manufacturer advises against using the drug during pregnancy or breastfeeding. No increased risk of malignancy has yet been detected in clinical trials or long-term follow-up studies (Nishimoto et al., 2009; Schiff et al., 2011). These data, however, are from interventional studies and we await the outcome of observational and registry studies, along the lines of those developed for TNF inhibitors, which are more appropriate study designs to investigate these long-term outcomes. Of 2816 patients sampled in the five phase III tocilizumab studies, 64 (2.3%) tested positive for anti-drug antibodies at least once; 75% of these patients had anti-drug antibodies present at baseline, i.e., before tocilizumab dosing onset (Stubenrauch et al., 2010). Twenty-one patients suffered adverse events of a potentially immunogenic nature, eight of whom had an anaphylactic reaction (Stubenrauch et al., 2010). Fatal anaphylaxis has been reported after marketing authorization during treatment with tocilizumab and is included in the advice to patients (http://www.ema.europa.eu/docs/en_GB/document_library/EPAR_-_Product_Information/human/000955/WC500054890.pdf). These anaphylactic reactions generally occur after the second to fifth infusions of tocilizumab and are more common at the lower dose of 4 mg/kg (Schiff et al., 2011). The patient guidance therefore includes reference to hypersensitivity reactions, and the EULAR treatment guidelines recommend a starting dose of 8 mg/kg (Smolen et al., 2014), although the dose can be reduced in the event of blood abnormalities associated with tocilizumab. 7. Other Anti–Interleukin-6 Drugs in Development. A number of novel monoclonal antibodies designed for IL-6 blockade are currently in clinical trials (detailed in Yao et al., 2014). Sarilumab is a fully human IgG1 against the IL-6R. After successful phase II studies (Huizinga et al., 2014), it is currently undergoing phase III program in RA, including RCTs in TNF-naive and TNF-failure patients, as well as comparison with etanercept in patients who have failed adalimumab (http://clinicaltrials.gov/ct2/results?term=sarilumab&Search=Search). Siltuximab, a chimeric anti–IL-6Ra IgG1 inhibitor, is currently being studied in a number of neoplastic disorders. Sirukumab, which targets the IL-6 cytokine itself, has completed phase I studies (Szepietowski et al., 2013) and is currently in phase III trials for RA (Reichert, 2013). IL-1α and IL-1β are proinflammatory cytokines implicated in a variety of chronic inflammatory diseases and are pivotal in inducing synovial inflammation in several animal models. In humans they are key mediators in bone resorption and cartilage destruction by inducing prostaglandin E2 and proteolytic enzymes, such as matrix metalloproteinase (Dayer et al., 1986). Both these IL-1 cytokines act on IL-1 receptor and are inhibited by IL-1 receptor antagonist (IL-1Ra), a naturally occurring glycoprotein inhibitor that binds the IL-1 receptor without activating it. Inhibiting IL-1 by manipulating IL-1Ra, therefore, represented an appealing therapeutic strategy in RA and other chronic inflammatory diseases. This led to the development of anakinra (Kineret; Sobi, Inc., Waltham, MA), a recombinant, nonglycosylated version of human IL-1Ra (Fig. 2), delivered as a single daily subcutaneous injection. 1. Efficacy of Interleukin-1 Inhibition. The first clinical trial of IL-1Ra was a 24-week, double-blind RCT of 472 patients with RA who were randomized to three doses of anakinra (30, 75, or 150 mg) or placebo (Bresnihan et al., 1998). At 24 weeks, the primary outcome, ACR20, was achieved in 43% in the highest dose (150 mg) group and 34, 39, and 27% in the 75 mg, 30 mg, and placebo groups, respectively. Secondary measures, such as joint counts, patient self-assessments, and inflammatory markers, were also statistically improved. In addition, this was the first anticytokine trial to report decreased radiologic progression at 24 weeks. Subsequent phase II/III studies demonstrated the safety and efficacy in RA (Cohen et al., 2002, 2004). The dose-finding study evaluated the safety and efficacy of a range of anakinra doses (based on body weight) in combination with MTX in 419 patients with persistently active RA (Cohen et al., 2004). Anakinra was generally safe and well tolerated, with the ACR20 responses in the five active treatment groups demonstrating statistically significant dose-response relationship compared with the response in the placebo group. A subsequent study of 506 patients with active RA demonstrated the efficacy of anakinra 100 mg daily in conjunction with MTX, with 38% achieving the primary ACR20 outcome at 24 weeks compared with 22% in the placebo group (Cohen et al., 2004). Clinically meaningful improvements were again seen in several secondary outcomes. A Cochrane review of five trials of 2065 patients treated with anakinra showed an overall ACR20 response rate at 24 weeks of 38% in those treated with anakinra 50–150 mg daily compared with 23% in those who received placebo (Mertens and Singh, 2009). ACR50 and ACR70 responses were achieved by 18 and 7%, respectively, compared with 7 and 2% in the placebo arms. Therefore, anakinra is mildly to moderately effective and generally well tolerated in patients with active RA. However, efficacy results were generally inferior to those reported for the TNF inhibitors (not head-to-head studies). Therefore, although anakinra is licensed for use in active RA, it was not cost-effective (Clark et al., 2004) and is generally not recommended in current treatment guidelines because of the lower efficacy compared with other biologics (Smolen et al., 2014). 2. Safety of Interleukin-1 Inhibition. Safety was further assessed in large trial of 1399 patients with RA who were randomized 4:1 to anakinra 100 mg daily for 6 months or placebo and then followed with a 30-month open-label phase (Fleischmann et al., 2003). Serious infectious episodes occurred more frequently in the anakinra group (2.1 versus 0.4%), of which none were opportunistic infections. The Cochrane review confirmed the increased serious infections with anakinra (1.8%) compared with placebo (0.6%) (Mertens and Singh, 2009). Few other serious side effects were reported, although injection site reactions were common (71–81%), occasionally very painful (Furst, 2004; Mertens and Singh, 2009). This is particularly relevant as daily injections are required for anakinra, in contrast to the less frequent dosing regimen required for other biologics used in RA. However, when anakinra was combined with etanercept in an RCT, there was no improvement in clinical efficacy over etanercept alone, whereas the combination groups had an increased incidence of serious infections (Genovese et al., 2004). Anakinra is therefore not recommended in combination with TNF inhibitors. Canakinumab is a fully human monoclonal antibody targeting IL-1β, with a longer half-life than anakinra. Canakinumab was evaluated in a phase II dose-finding study with 277 patients with active RA on MTX (Alten et al., 2011). The primary endpoint of ACR50 response at 12 weeks was met in 26.5% in the group receiving canakinumab 150 mg subcutaneously every 4 weeks compared with 11.4% receiving placebo. Secondary outcomes were also improved, and there were no safety concerns. However, integrated model-based analysis that included data from published trials suggested there was only a low probability that canakinumab would be better than the most effective treatments (Demin et al., 2012), and larger phase III trials have never been performed in RA. The high cost of canakinumab is also a limiting factor to its clinical utility. There are recent reports of a novel human anti–IL-1β monoclonal antibody with significantly greater neutralizing potency and affinity for IL-1β in vivo that may be a promising therapeutic candidate and awaits testing in clinical trials (Goh et al., 2014). AS is a chronic inflammatory arthritis characterized by inflammation in the spine, resulting in pain, stiffness, disability, and in many patients, fusion of the joints in the spine due to new bone formation. AS characteristically affects the sacroiliac joints at the base of the spine, with radiographic evidence of bilateral sacroiliac damage required for the modified New York criteria for AS (van der Linden et al., 1984). The diagnosis is therefore often made late in the disease. With advances in imaging technology, it is possible to detect sacroiliac inflammation earlier using magnetic resonance imaging (MRI) scans. In 2009, the Assessment in Ankylosing Spondylitis (ASAS) classification criteria were proposed for the broader term “axial spondyloarthritis” (axSpA), which encompasses both patients with established X-ray damage (AS) and patients with MRI or clinical manifestations but no diagnostic X-ray changes (nonradiographic axSpA) (Rudwaleit et al., 2009b). 1. Efficacy of Tumor Necrosis Factor Inhibitors for Ankylosing Spondylitis and Axial Spondyloarthritis. Although AS is pathogenetically distinct from RA, a biopsy study indicated that TNFα was expressed in inflamed sacroiliac joints in patients with AS (Braun et al., 1995), whereas case reports and a small pilot study suggested TNF inhibitors could have clinically relevant benefit in AS, prompting larger phase III studies. Because the axSpA criteria only entered clinical practice recently, the initial trials of anti-TNF therapies all recruited patients who fulfilled the modified New York criteria for AS (van der Linden et al., 1984), apart from one small trial that used the ESSG (European Spondylarthropathy Study Group) criteria (van den Bosch et al., 2002). More recently, trials have started using the ASAS criteria for axSpA. Most studies required participants to have failed at least one NSAID before inclusion. Earlier trials also generally excluded patients with complete boney fusion (ankylosis) of the spine, apart from the trial by Dougados et al. (2011), which specifically tested the effect in patients with moderate to severe existing ankylosis and new bone formation. The definition of “active disease” for eligibility varied, but was most commonly patient-reported disease activity using the Bath Ankylosing spondylitis Disease Activity score (BASDAI) and spinal pain visual analog scale. The primary efficacy endpoints and their timing also varied across studies. Generally, efficacy was assessed between 6 (for earlier exploratory studies) and 24 weeks, with 12 weeks the most commonly used time point. Similar to RA, response criteria have been developed and validated for evaluating treatments in AS, termed the ASAS response criteria. The most commonly used endpoint in clinical trials and the one used by the regulators is the ASAS20, which is defined as a ≥20% improvement and an absolute improvement of at least one unit, compared with baseline, in at least three of the following four domains, with no deterioration (defined as a worsening of ≥20% or an absolute increase of at least one unit) in the remaining domain: physical function, spinal pain, patient global assessment of disease activity, and inflammation (from questions 5 and 6 of BASDAI relating to the severity and duration of morning stiffness) (Anderson et al., 2001). Infliximab was the first TNF inhibitor to demonstrate efficacy in reducing disease activity in active AS (Braun et al., 2002). However, in contrast to RA where infliximab is typically used at a dose of 3 mg/kg every 8 weeks (after the initial loading phase), this dose was less effective in AS (Inman and Maksymowych, 2010), although other studies have questioned this (Tenga et al., 2011). The phase III studies submitted for the regulatory approval of infliximab for AS used a dose of 5 mg/kg every 6 weeks that demonstrated efficacy with 61.2% of patients on infliximab achieving an ASAS20 response at 24 weeks compared with 19.2% receiving placebo (van der Heijde et al., 2005), which is sustained with regular therapy (Baraliakos et al., 2005; Braun et al., 2008; Heldmann et al., 2011). Subsequently, etanercept and adalimumab also demonstrated efficacy and safety in AS in phase III studies (Davis et al., 2003; van der Heijde et al., 2006). The primary ASAS20 response was achieved at 12 weeks in 59% who received etanercept compared with 28% receiving placebo (Davis et al., 2003) and by 59% of patients receiving adalimumab compared with 21% receiving placebo (van der Heijde et al., 2006). The higher dose of infliximab required for AS has cost implications and resulted in some guidelines not recommending infliximab for AS (http://www.nice.org.uk/TA143), resulting in adalimumab and etanercept becoming the most widely prescribed biologic agents for the treatment of active AS. Golimumab has subsequently also been shown to be effective in active AS at two doses, with ASAS20 responses of 60% in the active arms and 22% in the placebo arm and no new safety signals (Inman et al., 2008). The various anti-TNF agents again appear to have remarkably similar response rates in AS, which was also the case in RA. 2. Tumor Necrosis Factor Inhibitors for Early Axial Spondyloarthritis, Including Nonradiographic Axial Spondyloarthritis. There have been few studies of TNF inhibitors for the treatment of the broader axSpA group beyond just AS. Before the development of the ASAS criteria for axSpA, several small studies suggested that TNF inhibitors had clinical efficacy and improved spinal inflammation on MRI scans in patients with recent onset back pain (Barkham et al., 2009; Song et al., 2011). The reduced inflammation on MRI with etanercept correlated with reduced disease activity, with similar improvement in clinical response between the AS and nonradiographic axSpA patients on post hoc analysis (Song et al., 2013b). The ABILITY-1 (Efficacy and safety of adalimumab in patients with nonradiographic axial spondyloarthritis) study compared adalimumab to placebo in patients with nonradiographic axSpA (Sieper et al., 2013), whereas the RAPID-AxSpA (Efficacy of certolizumab pegol on signs and symptoms of axial spondyloarthritis including ankylosing spondylitis) study compared two doses of certolizumab with placebo in patients fulfilling the axSpA criteria (AS or nonradiographic axSpA plus either raised CRP or positive MRI) (Landewe et al., 2014). In both studies, significantly more patients receiving anti-TNF therapy achieved the clinical endpoint than in the placebo group, with efficacy and safety profiles similar to those seen previously with AS studies. These study results were successfully used to obtain EMA licensing approval for etanercept, adalimumab, and certolizumab for the treatment of axSpA. However, the FDA’s Arthritis Advisory Committee did not recommend expanding the license for TNF inhibitors to nonradiographic axSpA (http://www.fda.gov/downloads/AdvisoryCommittees/CommitteesMeetingMaterials/Drugs/ArthritisAdvisoryCommittee/UCM361563.pdf), based mainly on issues relating to the definition and diagnosis of nonradiographic axSpA (outlined and addressed in a recent consensus response; Deodhar et al., 2014). 3. Comparison of Tumor Necrosis Factor Inhibitors for the Treatment of Ankylosing Spondylitis. Similar to the case in RA, the various TNF inhibitors appear to have remarkably similar response rates in AS clinical trials, although there have been no direct head-to-head comparisons. A recent study indirectly comparing the results of different RCTs of anti-TNF therapy for AS in a single evidence synthesis framework confirmed that infliximab 3 mg/kg was not efficacious, whereas there were no significant between-treatment differences for etanercept, adalimumab, infliximab 5 mg/kg, and golimumab (Shu et al., 2013). This was confirmed in a meta-analysis of AS treatment with TNF inhibitors that reported that etanercept, infliximab (5 mg/kg), adalimumab, and golimumab were all effective at reducing the signs and symptoms of the axial (spinal) component of AS, although long-term safety outcomes were still awaited (Machado et al., 2013). A report for the UK National Institute for Health and Care Excellence appraisal of golimumab for AS found there was overlap in the 95% credible intervals between golimumab, etanercept, and adalimumab, apart from a greater risk of treatment discontinuation for golimumab than for etanercept (relative risk, 4.30; 95% CI, 1.01–18.50) (Armstrong et al., 2013). 4. Switching Tumor Necrosis Factor Inhibitors in Ankylosing Spondylitis. Most of the large phase III studies were done in AS patients who were biologic-naive, with most of the evidence relating to switching of TNF inhibitors in AS from observational or registry data. The available data suggest that switching to a second anti-TNF agent in AS can be effective, although response rates and drug survival were lower in switchers than those who did not switch (Lie et al., 2011; Glintborg et al., 2013). Until alternative effective biologic agents are available for the treatment of AS and axSpA, switching of TNF inhibitor will remain the only realistic option for patients who fail to respond adequately to their first anti-TNF agent. 5. Tumor Necrosis Factor Inhibitor Withdrawal or Dose Reduction in Axial Spondyloarthritis. Long-term extension studies have shown sustained clinical efficacy of TNF inhibitors in patients who continue treatment (Baraliakos et al., 2011a, 2013a). A number of small and open-label extension studies have evaluated withdrawal of TNF inhibitors in AS and axSpA patients who are in remission. Discontinuation of the anti-TNF therapy in AS generally results in rapid relapse of active disease (reviewed in Baraliakos et al., 2013b, and Song et al., 2013a). This was also the case in early disease, although a recent study in patients with very early disease (mean 1.8 years) reported biologic-free remission/LDA rate of 94% during the 24-week follow up after induction therapy with infliximab and naproxen (Sieper et al., 2014b). It should, however, be noted that the percentage of patients in partial remission decreased steadily over the 6 months of follow up. In addition, the initial study excluded NSAID failure patients and 39% of the NSAID only arm were also in remission at 24 weeks (Sieper et al., 2014a). Therefore, discontinuation of therapy with anti-TNF agent frequently leads to relapses in AS and axSpA and cannot be recommended at this stage. However, dose reduction may be an effective option in AS patients with good disease control (Navarro-Compan et al., 2011; Morck et al., 2013) and is worthy of further evaluation in larger, formal studies. 6. Safety of Tumor Necrosis Factor Inhibitors in Ankylosing Spondylitis. Although the initial small study reported increased adverse events, including TB (Braun et al., 2002), subsequent studies have not indicated any increased or new safety signals in AS. In fact, patients with AS generally tolerate anti-TNF agents better than patients with RA (Scire et al., 2013), presumably at least partially due to their younger age, lower previous or current exposure to corticosteroids, and other immunosuppressant therapies. 7. Immunogenicity in Ankylosing Spondylitis. There is limited data regarding the immunogenicity of anti-TNF agents in AS and axSpA. It should also be noted that because MTX is not effective for the spinal symptoms in AS, the TNF inhibitors, including infliximab, are used as monotherapy in AS, whereas in RA, combination with DMARDs (typically MTX) is standard practice for all TNF inhibitors and required for infliximab. Data from the European AS Infliximab Cohort (EASIC) suggests that most patients had sustained benefit with regular infliximab therapy but that discontinuation and reintroduction of infliximab was associated with frequent hypersensitivity reactions (Heldmann et al., 2011). More recent studies indicated that up to 25% of SpA patients develop antibodies to infliximab and that these correlate with increased disease activity and discontinuation of therapy (Plasencia et al., 2012). However, the addition of MTX was not found to have a significant influence on the pharmacokinetics of infliximab or variability of disease activity (Ternant et al., 2012). Furthermore, clinical efficacy only correlated weakly with serum levels of infliximab, whereas drug monitoring did not improve disease activity (Meric et al., 2011; Ternant et al., 2012). Therefore, the current data do not support the addition of MTX to infliximab or other TNF inhibitors in AS. Psoriatic arthritis (PsA) is a chronic inflammatory arthritis that occurs in up to 30% of patients with the inflammatory skin disorder psoriasis (Gelfand et al., 2005; Haroon et al., 2013). Whereas joint disease in RA is characterized by synovitis and erosion of peripheral joints, PsA is characterized by skin disease (psoriasis), enthesitis (inflammation of tendon insertions into bone), and spinal disease (similar to the axial disease in axSpA) in addition to synovitis of peripheral joints. As in RA, synovial fluid from inflamed peripheral joints in patients with PsA contains increased levels of TNFα, which may be directly involved in joint damage (Partsch et al., 1997). This led to several trials of TNF inhibitors in PsA over the past 10 years, which have mostly showed evidence of benefit. The primary endpoint in PsA used by the regulators, and therefore most phase III RCTs, was the ACR20, which was borrowed from RA (described previously). It should be noted that although this reflects peripheral joint involvement, it does not capture many of the other components of PsA described above and performs poorly when axial (spinal) disease or enthesitis is the dominant problem. Etanercept was approved for the treatment of PsA in the United States and Europe in 2002. In the initial RCT in PsA, the ACR20 response rate at 12 and 24 weeks was significantly higher for those receiving etanercept compared with placebo at 59 versus 15% and 50 versus 13%, respectively (Mease et al., 2004). The ACR50 response rates at 24 weeks were 37 versus 4%, respectively. Radiographic progression was also improved at 24 weeks as were quality of life indices. Although higher doses of etanercept may confer additional benefit for the skin psoriasis (Leonardi et al., 2003), there was no added benefit in joint disease (Sterry et al., 2010), and as a result, the recommended dosage of etanercept in PsA is 50 mg per week (the same as for RA and AS). The efficacy of infliximab (5 mg/kg) in PsA was demonstrated in IMPACT 1 and 2 (Infliximab Multinational Psoriatic Arthritis Controlled Trials) (Antoni et al., 2005a,b). The ACR20 response rates at weeks 14 and 16 were 65 and 58% for the infliximab groups compared with 10 and 11% in the placebo groups in those trials. Enthesitis, dactylitis, HAQ, and the psoriasis area and severity index (PASI) scores were all improved, whereas radiographic progression was reduced in the infliximab groups (Antoni et al., 2008). Similarly, the efficacy of adalimumab in PsA was demonstrated in the ADEPT (Adalimumab Effectiveness in Psoriatic Arthritis Trial) study (Mease et al., 2005). The ACR20 response rates were 57% for adalimumab and 15% for the placebo group at 6 months. In the extension open-label study, radiologic progression was diminished by adalimumab (Gladman et al., 2007). The other two currently available TNF inhibitors, golimumab and certolizumab, were subsequently also shown to be effective in PsA with similar ACR response rates (Kavanaugh et al., 2009; Mease et al., 2014a). As for the other TNF inhibitors, these agents also improved dactylitis and enthesitis scores, as well as delaying radiographic progression. A meta-analysis reported no significant differences in ACR50 response rates at 24 weeks between infliximab, adalimumab, etanercept, or golimumab (Fenix-Caballero et al., 2013); however, the ACR70 response rates were slightly less with etanercept compared with the monoclonal antibodies. Serious adverse events for all these agents were largely similar and not substantially higher than in the placebo groups. Several TNF inhibitors have demonstrated efficacy in patients with moderate-to-severe plaque psoriasis. A double-blinded randomized controlled trial compared three doses of etanercept with placebo in 652 patients with plaque psoriasis involving at least 10% of their body surface (Leonardi et al., 2003). At 12 weeks, the PASI75 (at least 75% improvement in psoriasis area and severity index) response rates were 14% (25 mg weekly), 34% (25 mg twice weekly), and 49% (50 mg weekly) in the three treatment groups compared with 4% in the placebo group. The PASI75 rates in the etanercept groups increased to 25, 44, and 59% at 24 weeks. A second randomized controlled trial compared a higher dose of etanercept (50 mg twice weekly) with placebo in 618 patients with moderate-to-severe psoriasis (Tyring et al., 2006). The PASI75 rates at 12 weeks were 47% for the high-dose etanercept compared with 5% for placebo. Fatigue and depression scores were also significantly improved by etanercept. In both trials, safety and tolerability were similar in all treatment groups, with no serious infections or malignancies noted. As a result of the above studies, many centers initiate etanercept at a dose of 50 mg twice weekly for the first 3 months and then reduce this to the standard dose of 50 mg weekly for maintenance therapy. Adalimumab has also shown efficacy as monotherapy in moderate-to-severe psoriasis (Menter et al., 2008). At week 16, PASI75 was achieved in 71% receiving adalimumab compared with 7% receiving placebo. A follow-up study compared higher doses of adalimumab (80 mg initially, then 40 mg every other week) to MTX (up to 25 mg/week) and placebo (Saurat et al., 2008). Adalimumab led to a significant and rapid response, with PASI75 response rates of 79.6% (adalimumab), 35.5% (MTX), and 18.9% (placebo) at week 16. Infliximab demonstrated similar PASI75 response rates at 10 weeks for the 5 mg/kg (76%) and 3 mg/kg (70%) doses, which were both significantly higher than the placebo group (2%) (Menter et al., 2007). The PASI75 response rates at 12 weeks for certolizumab 200 and 400 mg were 75 and 83%, respectively, compared with 7% for placebo (Reich et al., 2012a). Golimumab efficacy for psoriasis was evaluated as a secondary endpoint in patients treated for psoriatic arthritis (Kavanaugh et al., 2009). Osteoarthritis (OA) is the most prevalent type of arthritis worldwide causing disability and contributing significantly to overall health care costs. Previously believed to result from cumulative mechanical trauma sustained over time, OA has now been shown to be a more complex process involving genetic predisposition, mechanical integrity, and local inflammatory processes. Synovial biopsies in OA patients, particularly in areas of cartilage destruction, have demonstrated increased levels of IL-1β and TNFα, which are likely to contribute to OA pathogenesis, although the levels are lower than those seen in RA (Smith et al., 1997). Although animal models of OA demonstrated promising results with anticytokine therapies, these have to date not been replicated in humans (Calich et al., 2010; Jotanovic et al., 2012). A small (n = 12) open-label study of adalimumab in patients with erosive hand OA showed no significant improvement in symptoms, and only one patient achieved an ACR20 response at 3 months (Magnano et al., 2007). A subsequent double-blinded placebo-controlled RCT of adalimumab in 60 patients with erosive hand OA reported no difference in overall progression of structural damage over 12 months, although a subgroup of patients who had associated overlying soft tissue swelling showed significantly less erosive evolution (Verbruggen et al., 2012). A recent double-blinded RCT in 85 patients with painful erosive hand OA compared adalimumab and placebo, with a primary outcome of the percentage of patients achieving a ≥50% improvement in global pain (visual analog scale) between week 0 and week 6 (Chevalier et al., 2014). There was no significant difference between the treatment groups in the primary outcome, which was achieved by 35% of the adalimumab and 27% of the placebo groups. There were also no statistically significant differences in secondary outcomes, which included swollen and tender joint counts. The interleukin-1 receptor antagonist inhibitor anakinra has also been investigated in patients with symptomatic knee OA. The largest double-blinded RCT was conducted in 170 patients who received anakinra 50 mg, 150 mg, or placebo as a single intra-articular injection (Chevalier et al., 2009). At week 4, there was no improvement in Western Ontario and McMaster Universities Osteoarthritis Index pain scores between the groups. Although catabolic cytokines may be implicated in pathogenesis of OA, they do not seem to be primary drivers of progression of articular damage or pain. Inflammatory bowel disease (IBD) is a term mainly used to describe Crohn’s disease (CD) and ulcerative colitis (UC), which both involve inflammation of the gastrointestinal tract. UC only affects the colon, whereas CD can affect any part of the digestive tract. In the early 1990s it was demonstrated that TNFα levels were significantly elevated in the lamina propria intestinal cells of patients with IBD and that TNFα served as an important mediator of inflammation in the human gut (MacDonald et al., 1990; Murch et al., 1993). TNF inhibitor studies in IBD are more complex and difficult to interpret due to the variable doses and induction and maintenance regimens employed. In 1997, Targan et al. (1997) tested a prototypic antibody against TNFα, which was later branded as infliximab, in patients with resistant CD. This initial 12-week double-blinded RCT compared a single intravenous infusion of one of three doses of infliximab (5, 10, or 20 mg/kg) with placebo. At 4 weeks, 81, 50, and 64% of the respective infliximab groups and 17% in the placebo group achieved the primary end point of a 70 or more point reduction of the Crohn’s Disease Activity Index (CDAI). In addition, 33% of those receiving a single infusion of infliximab achieved remission (CDAI < 150) compared with only 4% receiving placebo (Targan et al., 1997). A subsequent RCT assessed the benefit of maintenance infliximab therapy in patients who respond to a single infusion of infliximab (Hanauer et al., 2002). In this study, 573 patients with active resistant CD were given a single 5 mg/kg i.v. infusion of infliximab, then 2 weeks later response to treatment was assessed, and those who responded to the infliximab infusion (n = 335) were randomized to subsequently receive either infusions of infliximab (5 or 10 mg/kg) or placebo. The two coprimary endpoints were the proportion of patients in CDAI remission at week 30 and the time to loss of response up to week 54 in responders. At week 30, significantly more patients in the infliximab maintenance groups (39 and 45%, respectively) were in remission compared with the placebo maintenance group (21%). At 54 weeks the median time to loss of response was 38 weeks in the infliximab groups compared with 19 weeks in placebo group. Rates of serious infections were similar across groups. Infliximab also demonstrated benefit when added to patients with moderate to severe CD already on azathioprine 2.5 mg/kg, with 57% of the combination treatment arm in glucocorticoid-free remission compared with 44% of the infliximab monotherapy and 30% of the azathioprine monotherapy groups (Colombel et al., 2010). Mucosal healing on endoscopy has been reported as early as 4 weeks after commencement of therapy (D'Haens et al., 1999), and infliximab has also been shown to be effective in fistulising disease (Sands et al., 2004). Infliximab is licensed for IBD, with current treatment strategies starting with 5 mg/kg i.v. at weeks 0, 2, 6, and then every 8 weeks thereafter. Adalimumab has also been shown to be effective in IBD. In the initial CLASSIC-1 (Clinical Assessment of Adalimumab Safety and Efficacy Studied as Induction Therapy in Crohn's Disease) RCT, adalimumab induced CDAI remission at 4 weeks in 36% compared with 12% receiving placebo (Hanauer et al., 2006). The CHARM (Crohn's Trial of the Fully Human Antibody Adalimumab for Remission Maintenance) study investigated maintenance therapy, with all patients receiving open-label adalimumab induction therapy (80 mg at week 0 and 40 mg at week 2) followed by randomization to maintenance therapy with either adalimumab 40 mg every other week, adalimumab 40 mg weekly, or placebo (Colombel et al., 2007). At week 56, remission rates in the adalimumab groups were significantly higher compared with placebo (36 and 41 versus 12%). The efficacy of certolizumab induction therapy in CD was evaluated in the PRECISE-1 (Pegylated Antibody Fragment Evaluation in Crohn's Disease: Safety and Efficacy 1) RCT (Sandborn et al., 2007). Overall response rates at week 6 were 35% in the certolizumab group and 27% in the placebo group. However, remission rates at weeks 6 and 26 did not differ significantly between groups. This response was lower than that seen with infliximab or adalimumab. Participants who responded to the induction therapy in the above trial were then randomized to either certolizumab or placebo maintenance therapy (Schreiber et al., 2007). Initial responders who received certolizumab were more likely to have a maintained response and remission (63 and 48%, respectively) at 26 weeks compared with those who received placebo (26 and 29%, respectively). Subsequent studies have gone on to further evaluate the utility of certolizumab in CD, resulting in this agent receiving a license for the induction and maintenance of response in patients with moderate to severely active CD. Etanercept has also been studied in IBD. An initial small RCT (n = 43) showed etanercept 25 mg twice weekly was not effective in CD disease (Sandborn et al., 2001). The reason for the discrepant response seen in CD between etanercept and the monoclonal antibody inhibitors of TNF was explained by subsequent in vitro studies that demonstrated that infliximab, but not etanercept, induced apoptosis in lamina propria T cells in CD (Van den Brande et al., 2003). It is also possible that tissue drug concentrations may be a contributory factor. Two linked trials investigated infliximab in patients with resistant, severe UC (Rutgeerts et al., 2005). In each trial, 364 patients with active UC were randomized to receive infliximab 5 mg/kg, 10 mg/kg, or placebo. The combined response rates at 8 weeks were 64–69% in the infliximab groups (similar responses for both doses) and 29–37% in the placebo groups. Patients in the infliximab arms were more likely to have a clinical response at week 30 and less likely to undergo colectomy. Serious infections rates were similar in all groups. In the ULTRA-1 (Ulcerative Colitis Long-Term Remission and Maintenance with Adalimumab) study, patients with active UC naive to anti-TNF therapy were randomized to placebo or one of two adalimumab induction dose regimens of 160/80 mg or 80/40 mg (Reinisch et al., 2011). At week 8, 19% of patients in the higher dose adalimumab group and 10% of the low dose adalimumab group were in remission compared with 9% in the placebo group. The subsequent ULTRA-2 maintenance study included patients with active UC resistant to other therapies, including to infliximab (Sandborn et al., 2012b). Patients received either adalimumab (160 mg at week 0, 80 mg at week 2, and then 40 mg every other week) or placebo. At week 8, clinical remission was achieved in 17% of the infliximab group compared with 9% of the placebo group, with remission maintained at 52 weeks in 17 versus 9%. This model is the current initial recommended dosage regimen for adalimumab in UC, which differs from the fixed dose regimens used in RA, PsA, and AS. More recent trials of golimumab 50 mg, 100 mg, or placebo every 4 weeks demonstrated clinical response rates at week 54 of 47, 50, and 31%, respectively (Sandborn et al., 2014a,b), thereby demonstrating comparable efficacy to other monoclonal anti-TNF agents and adding a third biologic agent to the armamentarium for treating active UC unresponsive to traditional therapies. Sarcoidosis is an uncommon inflammatory condition of unknown cause characterized by granuloma formation. Any organ can be affected, with pulmonary and lymph node involvement most common. Targeting cytokines is theoretically advantageous in sarcoidosis because granuloma formation appears to be initiated and maintained by TNFα released by macrophages and other immune cells (Agostini, 2001). Given the cumulative toxic effects of systemic glucocorticoids and MTX, which are the standard therapies for sarcoidosis, TNF inhibitors may offer an alternative therapy option for those with resistant disease. Most current evidence for cytokine therapies in sarcoidosis is from case reports and observational studies. A small double-blinded RCT in 138 patients with chronic pulmonary sarcoidosis compared infliximab (3 or 5 mg/kg) with placebo, with the change in percentage of predicted forced vital capacity (FVC) as the primary endpoint (Baughman et al., 2006). Patients in the combined infliximab groups had a mean increase of 2.5% from baseline to week 24 in the percentage of predicted FVC compared with no change in placebo group, although no differences were seen in secondary dyspnea score endpoints. Although results were modest, post hoc analysis shows patients with more severe disease benefitted most. The clinical significance of this FVC improvement is unclear. Other case series have suggested that patients with extrapulmonary sarcoidosis may benefit more from infliximab than those with predominantly pulmonary sarcoidosis (Hostettler et al., 2012). Adalimumab therapy was evaluated in small open-label study of 11 patients with refractory pulmonary sarcoidosis, which reported that FVC stabilized in 7 and improved in 4 patients (Sweiss et al., 2014), although the larger trial was terminated due to difficulty recruiting participants. Trials with etanercept have been less favorable. A phase II open-label trial in patients with pulmonary sarcoidosis was terminated early due to treatment failure (Utz et al., 2003). In addition, there are several case reports of sarcoidosis associated with etanercept therapy for other conditions (Skoie et al., 2012; Miyagi et al., 2014). A trial of golimumab and ustekinumab for chronic sarcoidosis was recently completed but has not as yet been reported (http://clinicaltrials.gov/ct2/show/study/NCT00955279?term=sarcoidosis&rank=39). Uveitis is inflammation of the anterior chamber of the eye and can occur in isolation or in association with other conditions such as axSpA and IBD. After the success of TNF inhibitors in these conditions and reports that TNFα promotes ocular inflammation in animal studies, off-label anti-TNF therapy has been used in clinical practice and observational studies for noninfectious uveitis associated with a variety of conditions, such as in human leukocyte antigen-B27–related axSpA, juvenile idiopathic arthritis (JIA), Behcet’s disease, and vasculitis. There have been no formal RCTs of TNF inhibitors or other cytokine therapies for the treatment of uveitis, although studies of adalimumab, ustekinumab, and tocilizumab are currently underway (http://clinicaltrials.gov/ct2/results?term=uveitis&Search=Search). Analysis of data from four clinical trials of infliximab and etanercept in patients with AS found that patients treated with either anti-TNF agent had 6.8 anterior uveitis flares per 100 patient-years compared with 15.6 per 100 patient-years in the placebo groups (Braun et al., 2005). The reduction in uveitis flares was slightly more marked for infliximab compared with etanercept. Similar retrospective analysis of clinical trials in AS patients with uveitis reported that adalimumab reduced the rate of anterior uveitis flares by 58% in 274 patients with a history of anterior uveitis, by 68% in 106 patients with a recent history of anterior uveitis, by 50% in 28 patients with symptomatic anterior uveitis at baseline, and by 45% in 43 patients with chronic uveitis (Rudwaleit et al., 2009a). Several case series and small trials suggested clinical efficacy of TNF inhibitors in chronic childhood uveitis. A meta-analysis of these studies reported that the proportion of children responding was 87% for adalimumab (n = 31) and 72% for infliximab (n = 144), which both showed superiority to etanercept (n = 54) at 33% (Simonini et al., 2014). Several other studies also reported that adalimumab was more effective in patients with JIA-associated uveitis than etanercept (Heiligenhaus et al., 2007). The data for golimumab are limited but may suggest some benefit in patients with refractory uveitis. Miserocchi et al. (2014) reported a retrospective study of 17 patients with severe recalcitrant uveitis (13 JIA, 4 human leukocyte antigen-B27–related) despite previous biologics who were then treated with golimumab. A response to golimumab was seen in 14 of the 17, and the uveitis was inactive in 12 patients at the last visit (mean follow up 22 months). Although there are no prospective head-to-head studies comparing different anti-TNF agents, the current limited data suggest the monoclonal antibodies infliximab and adalimumab, and likely also golimumab, are more efficacious than etanercept in the treatment of noninfectious uveitis. JIA is a heterogeneous group of inflammatory arthritides in children that includes polyarticular JIA, extended oligoarticular JIA, enthesitis-related arthritis, juvenile PsA, and systemic JIA. To date, TNF antagonists, tocilizumab, abatacept, and anakinra have all shown efficacy and been approved for the treatment of JIA. Comparison between trials is challenging in light of changes in JIA disease definitions and outcome measures. Etanercept is currently one of the first line therapies used in all JIA subgroups. In the open-label CLIPPER (Clinical Study in Paediatric Patients of Etanercept for Treatment of ERA, PsA, and Extended Oligoarthritis) study of 127 patients with JIA, etanercept for 12 weeks demonstrated a JIA ACR30 response rate of 89% compared with historical placebo response rates of 15–41% (Horneff et al., 2014). An increased number of infections were reported in the etanercept group. The other approved anti-TNF agent for JIA is adalimumab, which was shown to be effective in a two-tiered open phase study of 171 patients who were then randomized at week 16 to either continuation or withdrawal of treatment (Lovell et al., 2008). At week 16, the JIA ACR30 response rate was 95% for those on combination therapy with MTX and 88% for those on adalimumab monotherapy. After treatment withdrawal, disease flares were more common in those on placebo (73%) compared with those who continued on adalimumab (43%). Tocilizumab is also licensed in Europe and the United States for treating systemic and polyarticular JIA (De Benedetti et al., 2012; Imagawa et al., 2012), with a safety profile similar to that seen in adults (Brunner et al., 2014). Inhibition of IL-6 in systemic JIA (also known as Still’s disease) is an attractive strategy, because this condition is driven primarily by IL-6 and IL-1β, with direct correlation between IL-6 levels and disease activity. RCTs of tocilizumab have reported JIA ACR30 response rates at week 12 of 85% with tocilizumab compared with 24% with placebo in patients with severe, persistent systemic JIA (De Benedetti et al., 2012). At week 52, the ACR50 and 70 response rates were also significantly increased, with 52% of patients able to discontinue oral glucocorticoids after tocilizumab treatment. However, elevated rates of serious infections, neutropenia and increased aminotransferase levels were reported in those on tocilizumab (De Benedetti et al., 2012). Despite this, there is accumulating evidence supporting the use of higher doses of tocilizumab in JIA compared with adults (De Benedetti et al., 2014). The use of biologic therapies in children has raised additional safety concerns, because patients are often on them long term, usually in combination with other immunosuppressive treatments. Based on its own systematic review, the FDA issued a warning with enhanced surveillance requirement in 2009 and update in 2011, stating an increased risk of malignancy in those receiving anti-TNF therapy for more than 2.5 years (http://www.fda.gov/Drugs/DrugSafety/ucm278267.htm). This topic is still controversial and difficult to clarify given the significant confounders involved. Castleman’s disease is an uncommon inflammatory lymphoproliferative disorder of unknown cause. Anti–IL-6 cytokine therapy in multicentric Castleman’s disease is particularly attractive given the systemic inflammatory processes and associated cachexia, which are key features of IL-6. Tocilizumab (IL-6R inhibitor) and siltuximab (a chimeric IL-6 antagonist) have been approved for this indication in Japan and by the FDA, respectively. In a multicenter open-label trial in 28 patients with HIV-negative multicentric Castleman’s disease, tocilizumab reduced lymphadenopathy and inflammatory markers and led to improvements in nutrition and fatigue scores, as well as hemoglobin levels (Nishimoto et al., 2005). In half of the patients, the glucocorticoid dose was able to be reduced by 50%. Results were maintained in the extension phase of the study (up to 3 years); however, relapses occurred on discontinuation of tocilizumab. The treatment was subsequently approved in Japan in 2005. Siltuximab was assessed in phase I and II RCTs (Kurzrock et al., 2013; van Rhee et al., 2014). At 48 weeks, a higher overall response rate was seen with siltuximab compared with placebo (34 versus 0%), with improvements in anemia (61 versus 0%) and inflammatory markers. Treatment-related adverse events were similar to the placebo group. These data resulted in the FDA approving siltuximab for the treatment of Castleman’s disease in April 2014. Although clinical outlooks have improved with the introduction of biologics for RA, a significant proportion of patients still do not respond or only have a partial response to current biologic treatments, and as such, there remains significant unmet need and the search for potential therapeutic targets continues. As many of these agents are currently still undergoing phase II/III development programs, here we mainly give an overview of the reported studies. The IL-17/IL-23 (TH17) axis has been shown to be an important driver of autoimmune processes in murine models. Subsequently, this pathway has been implicated in several chronic inflammatory diseases in humans, such as RA, psoriasis, PsA, AS, IBD, and multiple sclerosis, making it a valuable target for therapeutic manipulation (Miossec and Kolls, 2012). The clinical experience of IL-17 therapy in a variety of conditions is described below. 1. Interleukin-17/23 in Rheumatoid Arthritis. Secukinumab is a highly selective, fully human monoclonal anti–IL-17A antibody (IgG1κ) that showed efficacy in proof-of-concept studies (Hueber et al., 2010). A phase II dose-finding RCT in patients with active RA reported that although ACR20 response rates at week 16 were numerically increased for the three highest secukinumab dosing groups (75 mg, 47%; 150 mg, 47%; 300 mg, 54%) compared with placebo (36%), these did not achieve statistical significance (Genovese et al., 2013a). However over 52 weeks, significant improvements were seen in the initial week 16 responders on the 150 mg dose (n = 20) who achieved ACR20 responses of 75 and 90% at weeks 24 and 52 and ACR70 response rates of 20 and 40%, respectively, suggesting there may be a delayed onset of action (Genovese et al., 2014a). There were no safety or tolerability issues and no dose-dependent adverse effects noted in the 52-week extension study (Genovese et al., 2013a). Ixekizumab is a highly specific, humanized monoclonal anti–IL-17A antibody (IgG4). In a phase II dose-finding RCT in RA patients, a significant dose-response relationship of ixekizumab was seen in week 12 ACR20 responses in biologic naive patients, thereby achieving the primary endpoint (Genovese et al., 2014b). In addition, the week 12 ACR20 responses were significantly better with the two highest doses of ixekizumab in patients who were TNF–IR compared with placebo. Brodalumab is a highly specific, human monoclonal antibody (IgG2) that binds IL-17RA, effectively blocking biologic activity of IL-17A, IL-17F, and IL-17E. A phase II dose-finding RCT in biologic-naive patients demonstrated no evidence of a clinical response in any dose tested (Martin et al., 2013). Taken together the data are thus far disappointing in RA for the role of IL-17 or IL-17RA inhibition. Whereas there are some signs of efficacy, perhaps in subsets of patients, it is unlikely on the current evidence that they will be competitive against the other agents already available. Whether there is a role for IL-17 blockade in the context of combination therapeutics also remains to be seen—this may be addressed with the advent of biospecific agents in due course. 2. Interleukin-17/23 in Crohn’s Disease. In support of the concept that the intestinal environment can drive the IL-17/IL-23 axis, evaluation of lesional intestinal tissue from patients with CD has demonstrated that both IL-17 and IL-23 are raised in areas with active inflammation. A phase IIa RCT of secukinumab in biologic naive patients with moderate to severe CD was stopped prematurely, because the mean change in CDAI between baseline and week 6 was greater in the placebo group (Hueber et al., 2012). Fourteen serious adverse events occurred in 10 patients (7 secukinumab, 3 placebo), including "worsening of disease" in 4 patients receiving secukinumab compared with 1 on placebo. In addition, 20 infections (4 fungal) were reported in the secukinumab group compared with none in the placebo group. Given the higher rates of mucocutaneous candidiasis in this trial (unusual with other biologics), it was suggested that disease exacerbation may be linked to proliferation of Candida albicans, but this is yet to be proven (Colombel et al., 2013). Brodalumab was similarly evaluated in a dose-ascending phase II RCT in moderate to severe CD, which has yet to be published as a full paper. It is reported in an abstract that after 130 of the planned 216 patients were randomized, an independent data review team unblinded the safety data and found a worsening of CD in the active treatment groups (Targan, 2012). Although the study was stopped early, no safety risks beyond worsening of symptoms were noted among the groups. These trials demonstrate the complexity of targeting the IL-17 (TH17) pathway in IBD, with a worsening of disease with IL-17 inhibition using secukinumab and brodalumab. Ustekinumab, a monoclonal antibody targeting the p40 subunit of IL-12 and IL-23, was initially investigated for efficacy in a phase IIa double-blinded, crossover RCT in patients with moderate to severe CD (Sandborn et al., 2008). Clinical response rates were significantly higher among patients receiving ustekinumab (subcutaneously or intravenously) than placebo (53 versus 30%) at weeks 4 and 6, but then diminished by week 8 (49 versus 40%). Within this study, a subgroup of 49 patients who were previously given infliximab (either primary or secondary nonresponders) had a significantly greater clinical response rate through week 8 with ustekinumab compared with placebo. This early efficacy signal leads to further investigation of ustekinumab in CD in a phase IIb double-blinded RCT in patients with moderate to severe CD who had previously failed anti-TNF therapy (Sandborn et al., 2012a). The proportions of patients who met the clinical response primary endpoint at 6 weeks were 34–40% for the three doses of intravenous ustekinumab and 24% for placebo (all P ≤ 0.05), although there was no statistically significant difference in clinical remission between the groups at week 6. In the maintenance phase, responders to ustekinumab at week 6 were randomly assigned to subcutaneous ustekinumab or placebo. At week 22, those receiving ustekinumab had a significantly increased response rate compared with placebo (70 versus 43%), as well as increased clinical remission rates (42 versus 27%). No serious opportunistic infections, major adverse cardiovascular events, or deaths were reported up to the 36-week safety analysis; however, there was a small increase in serious nonopportunistic infections in the 6 mg/kg ustekinumab group. Phase III trials (UNITI [Randomized placebo-controlled trials evaluating ustekinumab in moderate-to-severely active CD] program) of ustekinumab in CD are ongoing. IL-17 dermal cells and the TH17 pathways have been implicated in psoriasis plaque development, making this a logical therapeutic target. A proof-of-concept trial demonstrated improvements in various psoriasis measures after a single intravenous infusion of secukinumab (AIN457), accompanied by significant reduction in dermal IL-17A T cells on immunohistological analysis of psoriatic skin samples (at week 4) and selective modulation of a variety of important cytokines on molecular profiling (Hueber et al., 2010). The phase IIb dose-ranging RCT in patients with moderate to severe plaque psoriasis reported significantly greater PASI75 response rates at week 12 with two doses of subcutaneous secukinumab (75 mg, 57% and 150 mg, 82%) compared with placebo (9%) (Papp et al., 2013b). Patients with prior exposure to anti-TNF therapies had similar responses, and PASI scores remained improved (albeit diminished) compared with placebo 12 weeks after treatment had ceased. A separate phase IIb study assessed three different regimens of secukinumab 150 mg in patients with moderate to severe plaque psoriasis (Rich et al., 2013). The weekly and monthly induction regimens with secukinumab resulted in significantly greater PASI75 (55 and 42% versus 2%) and PASI 90 (32 and 17% versus 2%) response rates than placebo at week 12. Primary responders were rerandomized into maintenance treatment with either secukinumab 150 mg scheduled at weeks 12 and 24 or treatment at time of relapse. The fixed-interval maintenance strategy demonstrated significantly higher PASI responses from week 20 to week 28. In all phase II trials, there appeared to be comparable, low rates of serious adverse events between secukinumab and placebo cohorts, with no signals for increased infection risk. Several phase III trials have commenced. The safety and efficacy of subcutaneous ixekizumab were evaluated in a phase IIb dose-finding RCT in moderate to severe psoriasis, which reported significantly greater PASI75 response rates at 12 weeks in the three highest doses of ixekizumab compared with placebo (75–83% versus 8%) (Leonardi et al., 2012). Increased PASI90 scores were also seen and responses were maintained through week 20. Phase III studies are ongoing, with etanercept comparator arms (UNCOVER [Phase 3 Studies in Participants with Moderate to Severe Psoriasis] program). Similar PASI75 response rates (77–82%) have been reported in phase II trials for brodalumab in patients with moderate-to-severe plaque psoriasis (Papp et al., 2012). In the brodalumab 210 mg arm, two cases of grade 3 neutropenia were reported. Overall, anti–IL-17 therapies show excellent efficacy in chronic plaque psoriasis, with good tolerability and few documented adverse events. PASI75 responses in the phase II studies appear largely similar for brodalumab (82%), secukinumab (81%), and ixekizumab (83%). IL-23, is involved in TH17 function, and therefore a potentially interesting pharmacological target in the treatment of psoriasis. The IL-12/23 inhibitor, ustekinumab, was initially shown to be efficacious in a phase II trial that reported PASI75 response rates of up to 81% compared with 2% in the placebo group (Krueger et al., 2007). This was followed by two large phase III trials. In PHOENIX I (Efficacy and safety of ustekinumab in patients with moderate-to-severe psoriasis), PASI75 response at week 12 were achieved in 67% (45 mg ustekinumab), 66% (90 mg ustekinumab), and 3% (placebo) (Leonardi et al., 2008). Patients who were rerandomized to maintenance ustekinumab at week 40 showed better PASI75 scores at 1 year compared with those taken off therapy. PHOENIX II demonstrated that more frequent administration (8 versus 12 weeks) at higher doses (90 mg) can be beneficial for patients experiencing a partial response (Papp et al., 2008). A subsequent large head-to-head RCT demonstrated superiority of ustekinumab 45 or 90 mg (68 and 74%) over high-dose 50 mg twice weekly etanercept (57%) in PASI75 response rates at 12 weeks with similar safety patterns (Griffiths et al., 2010). After 5 years of exposure to ustekinumab, no dose-related or cumulative toxicity was observed, and malignancy rates were similar to the general population. Adverse events were generally comparable to other biologics (Papp et al., 2013a). 4. Interleukin-17/23 in Psoriatic Arthritis. Animal models clearly support the IL-17/IL-23 axis in both the skin and joint aspects of disease pathology in PsA. Furthermore, the evaluation of clinical samples has demonstrated that elevated IL-17 and IL-23 is present in the psoriatic skin and synovial fluid of PsA patients (Benham et al., 2013). In a phase IIa proof-of-concept RCT in patients with moderate to severe PsA (n = 42), there was no statistically significant difference in the ACR20 response rates at 6 weeks between secukinumab and placebo (39 versus 23%) (McInnes et al., 2014). However, there were significant reductions in acute phase reactants (CRP and ESR) and improvements in quality-of-life measures from baseline to week 6 in the secukinumab group. Given the trend in positive outcomes, a phase III trial is planned. No directed trials for ixekizumab in PsA have been conducted. However, results extrapolated from patients reporting PsA in the phase II psoriasis trial showed statistically significant improvement in the joint pain score at 12 weeks compared with baseline in the 150 mg ixekizumab group (8 patients out of 28 in that group) (Leonardi et al., 2012). This prompted a phase III safety and efficacy trial that is ongoing. A phase II RCT in 168 patients with PsA, reported week 12 ACR20 response rates of 37 and 39% for the two brodalumab doses compared with 18% for placebo, with significant improvement in CRP, DAS28, and ACR50 response rates (Mease et al., 2014b). A phase III trial in PsA has commenced. Ustekinumab has been more extensively studies in PsA. The initial phase II crossover RCT was performed in patients with active PsA (defined as ≥3 swollen and tender joints and either CRP ≥ 15 mg/l or morning stiffness ≥ 45 minutes) who also had active plaque psoriasis and had been poor responders to NSAIDs, DMARDs, and/or anti-TNF therapy (Gottlieb et al., 2009). The primary endpoint, ACR20 response at week 12, was achieved in 42% in the ustekinumab group versus 14% in the placebo group. Secondary outcomes included superior ACR50 (25 versus 7%; P = 0.003) and ACR70 (11 versus 0%; P = 0.005) response rates, and improvement in HAQ scores. Subsequently, the P-SUMMIT I (Efficacy and safety of ustekinumab in patients with active psoriatic arthritis) phase III RCT evaluated two doses of ustekinumab (45 and 90 mg) in 615 biologic-naive patients with active PsA (≥5 tender and ≥5 swollen joints, CRP ≥ 3.0 mg/l, and past or present plaque psoriasis) who were randomized to receive ustekinumab or placebo at weeks 0, 4, and every 12 weeks thereafter (McInnes et al., 2013). At week 16, poor responders (<5% improvement) entered a masked early escape option and were given 45 mg ustekinumab (if in the placebo group) or 90 mg ustekinumab (if in the 45 mg group). The primary endpoint ACR20 response at week 24 was achieved in a significantly higher proportion in the ustekinumab groups than placebo (42 and 50% versus 23%, respectively). In addition, improvements were seen in DAS28-CRP, HAQ, BASDAI, and dactylitis, enthesitis, and PASI scores, with improvements maintained through to 52 weeks. The comparable P-SUMMIT II trial demonstrated ACR20 response rate of 44% in the ustekinumab groups (45 and 90 mg) compared with 20% in the placebo group (Ritchlin et al., 2014). The study included 180 patients previously treated with ≥1 TNF inhibitor (most had received ≥2 agents with lack of effect) who had ACR20 response rates of 36% with ustekinumab compared with 15% with placebo). A pooling of radiographic data from both trials showed statistically significant inhibition of radiographic progression of joint damage at weeks 24 and 52 (Kavanaugh et al., 2014). 5. Interleukin-17/23 in Ankylosing Spondylitis. A phase II study in AS (defined by 1984 modified New York criteria) reported ASAS20 response rates at week 6 of 59% with secukinumab compared with 24% with placebo, with a 99.8% probability that secukinumab is superior to placebo (Baeten et al., 2013). An MRI substudy reported improvement in MRI scores as early as week 6, which were maintained to week 28 after 2 doses of intravenous secukinumab (Baraliakos et al., 2011b). Ustekinumab was evaluated in AS in an open-label, single-arm, proof-of-concept trial (Poddubnyy et al., 2014). The primary end point of a 40% improvement in disease activity (ASAS40) at week 24 was achieved by 65% of the patients, with ASAS20 response in 75%. There were also significant improvements in quality of life indicators, MRI scores, and a decline in acute phase reactants. There were no safety or tolerability issues. These promising results warrant further evaluation of IL-17 and IL-23 inhibition in AS and axSpA. 6. Interleukin-17 Inhibition in Other Conditions. In addition to the foregoing, there are a large number of studies of IL-17/23 inhibition either ongoing or being considered in many other conditions, including asthma, multiple sclerosis, uveitis, sarcoidosis, and Sjögren’s syndrome. The potential for these pathways offering benefit beyond the detailed discussions above is well recognized; however, these remain to be determined and the experience (particularly in RA and IBD) described above suggests they may yield some unexpected results, thereby providing further insights into the biology of the IL-17 pathway in humans. 7. Safety of Interleukin-17 Inhibition. Potential risks are likely to reside primarily in the area of infection risk. There are now large trial datasets emerging that inform these discussions and in general are reassuring. In addition we have knowledge gained from the mutations of the IL-17 cytokine family in humans, which predominantly point to risk of fungal infections, especially at barrier or mucosal skin sites, where the IL-17 family is implicated in host defense. Individuals with genetic deficiencies in IL-17A and IL-17F are prone to chronic mucocutaneous candidiasis and possibly Staphylococcus aureus (Puel et al., 2011). However, in phase II trials, anti–IL-17 therapies demonstrated infection rates (particularly candida) only slightly higher than those seen with placebo. Larger trials with longer duration are necessary to evaluate the long-term safety. As previously mentioned, worsening of bowel inflammation in those treated with secukinumab and brodalumab may represent superimposed candida infection; however, this has yet to be proven and may relate to changes in barrier function with IL-17 inhibition (Colombel et al., 2013). In addition, IL-17 cytokines affect neutrophil biology. Several cases of neutropenia were noted with all IL-17 inhibitors (albeit asymptomatic and unrelated to infection) and may be due to defective neutrophil trafficking in blood; however, this needs to be further characterized. As they are on the same pathway, there is also a theoretical risk of infection with anti–IL-12/23 therapy, particularly in those who are genetically deficient in IL-12/23p40 and IL-12Rβ1. This group has an inherent susceptibility to weakly virulent mycobacterial and salmonella infections (Filipe-Santos et al., 2006; van de Vosse and Ottenhoff, 2006). In IL-12p40–deficient mice, IL-23 restored immunity to mycobacterium TB infection (Wozniak et al., 2006). The safety of ustekinumab was evaluated in several phase II and III trials in psoriasis, PsA, and CD. Although the serious infection risk is similar to other biologics, there does not appear to be an increased risk of mycobacterial diseases, disseminated salmonellosis, or systemic fungal infections. In addition no particular infections related to IL-12/23 deficiency were identified (Papp et al., 2013a), and in pooled data from five psoriasis trials, no cases of latent TB infection reactivation were observed in patients receiving concomitant isoniazid prophylaxis for latent TB (Tsai et al., 2012). It is possible that IL-12/23 inhibition with ustekinumab is incomplete and therefore does not reduce host defense toward these opportunistic infections (Papp et al., 2013a). A 4-year safety analysis of 3117 patients with psoriasis who received at least one dose of ustekinumab showed no increased incidence of serious infections, malignancies (other than nonmelanoma skin cancer), or major adverse cardiovascular events, with levels consistent with expected levels based on population-based rates (Reich et al., 2012b). Similar results were seen with 5-year extension of this data (Papp et al., 2013a). Safety profiles in PsA and CD are similar to patients with psoriasis. However, follow up for long-term complications such as cardiac events and malignancy is necessary before conclusions can be drawn. GM-CSF is a cytokine that augments proliferation, differentiation, and maturation of macrophages and granulocytes and is implicated in several cellular processes including proinflammatory cytokine production, cell adhesion, and Janus kinase (JAK) transduction (Shibata et al., 2001; Shi et al., 2006). Preclinical studies have shown that neutralizing antibodies to GM-CSF in a murine model of arthritis led to improvement of joint inflammation and disease progression (Cook et al., 2001). In humans, macrophage differentiation in synovial tissues is already seen in very early RA (Singh et al., 2004), with higher levels of GM-CSF in synovial fluid and serum of affected patients (Xu et al., 1989; Fiehn et al., 1992). Mavrilimumab is a human monoclonal antibody (IgG4) that competitively binds GM-CSF receptor-a. A phase II double-blinded RCT evaluated escalating-dose subcutaneous mavrilimumab in 239 patients with RA already on MTX (Burmester et al., 2013). As early as 2 weeks, 55.7% of mavrilimumab-treated patients met the primary endpoint of a ≥1.2 decrease from baseline in DAS28-CRP score compared with 34.7% in the placebo group. The highest dose of mavrilimumab (100 mg) demonstrated the best results, with 66.7% achieving the primary endpoint. Decreases in disease activity biomarkers and improvements in ACR70 and HAQ scores were noted. No serious or opportunistic infections were noted, and no changes in pulmonary parameters or neutropenia were observed. Atacicept is a recombinant fusion protein (TACI/IgG1 FC) that binds and inhibits both B-lymphocyte stimulator (BLyS), a cytokine involved in regulation and survival of B cells, and APRIL (a proliferation-inducing ligand), a similar cytokine involved in cell proliferation (Gross et al., 2000). These cytokines act to enhance B-cell survival, antigen presentation, and class-switch recombination (Dillon et al., 2006). BLyS levels are elevated in patients with RA, prompting suggestions that neutralization of BLyS would decrease B-cell activity and subsequent autoimmune processes implicated in its pathogenesis (Cheema et al., 2001). A phase Ib dose-escalating RCT suggested response as early as 2 weeks, with 32% achieving an ACR20 response at 12 weeks, whereas no response was seen in the placebo group (Tak et al., 2008). Dose-dependent decreases in immunoglobulin levels and pertinent biomarkers (including rheumatoid factor) were seen, as were reductions in mature B-cell numbers. The treatment was well tolerated, and no increased infection rate was seen compared with controls. A phase II RCT followed in which 311 patients with active RA were randomized into four groups to receive placebo, atacicept with and without a loading dose, or open-label adalimumab (van Vollenhoven et al., 2011). Atacicept failed to achieve the primary efficacy endpoint, with a similar ACR20 response rate at week 26 as placebo (45 versus 46%), whereas adalimumab achieved a response rate of 71%. Although immunoglobulin and circulating mature B-cell levels reduced with atacicept, there was no clinical effect, regardless of loading dose or whether patients had previously failed MTX or anti-TNF agents (Genovese et al., 2011). No significant safety signals were raised. Although this drug’s program in RA was ceased, it is still being investigated as a therapy in systemic lupus erythematosus, another autoimmune disease with a dominant B-cell component. Several anticytokine therapies have failed in RA trials, despite preclinical data to suggest efficacy. Most notable of these are the IL-1 and IL-17/23 pathway inhibitors, which are both discussed in more detail elsewhere. Briefly, although anakinra (interleukin-1 receptor antagonist) did demonstrate efficacy in RA, this was inferior to results seen with TNF inhibitors, which themselves also inhibit IL-1 downstream of TNFα. Subsequently, gout and several of the hereditary periodic fever syndromes have been shown to have a central inflammasome and IL-1 component, leading to IL-1 inhibitors becoming repurposed for these conditions. Similarly, IL-17/23 pathway inhibitors failed to demonstrate efficacy in RA but are proving effective in spondyloarthritis (AS, PsA) and related conditions (psoriasis), while exacerbating IBD. A critical recent innovation has been the development of small-molecule inhibitors that can relatively specifically inhibit the signal cascades upon which cytokine receptor signaling is based. Thus, in particular, a new family of chemical entities has been developed that inhibits the JAK family, comprising agents that variously inhibit JAK1, JAK2, JAK3, and TYK2. The first drug approved in class tofacitinib is a JAK1/3 inhibitor that has demonstrated unequivocal efficacy in RA and is now approved in several global regions, although not all. Detailed discussion of these agents is beyond the scope of this review, and the reader is referred to a recent overview of the subject (O'Shea et al., 2013). There will be several new agents coming soon in this space—these will offer distinct signal pathway specificities and, as such, they will allow us to dial into the actual receptor pathways that offer optimal efficacy at minimized toxicity. As the signal pathways are promiscuous with respect to their cytokine receptors served, these agents in fact offer de facto combinatorial cytokine inhibition. Their long-term success will therefore almost certainly be defined by the safety profile that can be reasonably achieved by this approach. The advent of biologic agents that target cytokines or their receptors was pioneered in the context of inflammatory diseases in RA. Their use has transformed the expectations of patients and health care professionals alike in terms of the magnitude and frequency of clinical responses that can be achieved. These benefits have been transferrable across the range of inflammatory diseases. Moreover, they offered robust confirmation of the pathogenetic role played by cytokines in inflammatory diseases, pointing to the pivotal cytokine activities that are absolutely required to sustain chronic responses in target tissues but also to redundancies that exist in the system that, once identified, can optimize the choice of targets for future drug development. Unmet needs remain—responses are often partial and not sustained long term; nonresponders remain problematic. In terms of disease aspiration, we ultimately seek to bring about drug-free remission—this can perhaps be achieved with combinatorial and strategic use of these powerful agents—such studies are in their infancy. Finally, we would ideally select the appropriate target for individual patients—stratified medicine represents the ultimate goal of the biologic therapeutic revolution. Wrote or contributed to the writing of the manuscript: Siebert, Tsoukas, Robertson, McInnes. (2001) Cytokine and chemokine blockade as immunointervention strategy for the treatment of diffuse lung diseases. Sarcoidosis Vasc Diffuse Lung Dis 18:18–22. (2013) Rituximab dissociates the tight link between disease activity and joint damage in rheumatoid arthritis patients. Ann Rheum Dis 72:7–12. (2005) Tumor necrosis factor and chemokine interactions in the formation and maintenance of granulomas in tuberculosis. Clin Infect Dis 41 (Suppl 3):S189–S193. (2011) Efficacy and safety of the human anti-IL-1β monoclonal antibody canakinumab in rheumatoid arthritis: results of a 12-week, Phase II, dose-finding study. BMC Musculoskelet Disord 12:153. (2011) Risk of non-melanoma skin cancer in a national cohort of veterans with rheumatoid arthritis. Rheumatology (Oxford) 50:1431–1439. (2001) Ankylosing spondylitis assessment group preliminary definition of short-term improvement in ankylosing spondylitis. Arthritis Rheum 44:1876–1886. (2005a) Infliximab improves signs and symptoms of psoriatic arthritis: results of the IMPACT 2 trial. Ann Rheum Dis 64:1150–1157. (2005b) Sustained benefits of infliximab therapy for dermatologic and articular manifestations of psoriatic arthritis: results from the infliximab multinational psoriatic arthritis controlled trial (IMPACT). Arthritis Rheum 52:1227–1236. (2008) Two-year efficacy and safety of infliximab treatment in patients with active psoriatic arthritis: findings of the Infliximab Multinational Psoriatic Arthritis Controlled Trial (IMPACT). J Rheumatol 35:869–876. (2013) Golimumab for the treatment of ankylosing spondylitis: a NICE single technology appraisal. Pharmacoeconomics 31:415–425. (2009) Cancer risk in patients with rheumatoid arthritis treated with anti-tumor necrosis factor alpha therapies: does the risk change with the time since start of treatment? Arthritis Rheum 60:3180–3189. (2013) Immunogenicity and autoimmunity during anti-TNF therapy. Autoimmun Rev 12:703–708. (2003) Influence of immunogenicity on the long-term efficacy of infliximab in Crohn’s disease. N Engl J Med 348:601–608. (2013) Anti-interleukin-17A monoclonal antibody secukinumab in treatment of ankylosing spondylitis: a randomised, double-blind, placebo-controlled trial. Lancet 382:1705–1713. (2013a) Long-term outcome of patients with active ankylosing spondylitis with etanercept-sustained efficacy and safety after seven years. Arthritis Res Ther 15:R67. (2013b) Withdrawal of biologic therapy in axial spondyloarthritis: the experience in established disease. Clin Exp Rheumatol 31(4, Suppl 78)S43–S46. (2005) Clinical response to discontinuation of anti-TNF therapy in patients with ankylosing spondylitis after 3 years of continuous treatment with infliximab. Arthritis Res Ther 7:R439–R444. (2011a) Persistent clinical efficacy and safety of infliximab in ankylosing spondylitis after 8 years—early clinical response predicts long-term outcome. Rheumatology (Oxford) 50:1690–1699. (2011b) Interleukin-17A blockade with secukinumab reduces spinal inflammation in patients with ankylosing spondylitis as early as week 6, as detected by magnetic resonance imaging (Abstract). Arthritis Rheum 63 (S10):2486D. (2009) Clinical and imaging efficacy of infliximab in HLA-B27-Positive patients with magnetic resonance imaging-determined early sacroiliitis. Arthritis Rheum 60:946–954. (2011) Development of antidrug antibodies against adalimumab and association with disease activity and treatment failure during long-term follow-up. JAMA 305:1460–1468. (2010) Anti-infliximab and anti-adalimumab antibodies in relation to response to adalimumab in infliximab switchers and anti-tumour necrosis factor naive patients: a cohort study. Ann Rheum Dis 69:817–821. (2006) Infliximab therapy in patients with chronic sarcoidosis and pulmonary involvement. Am J Respir Crit Care Med 174:795–802. (1999) Structural deficiencies in granuloma formation in TNF gene-targeted mice underlie the heightened susceptibility to aerosol Mycobacterium tuberculosis infection, which is not compensated for by lymphotoxin. J Immunol 162:3504–3511. (2013) Th17 and Th22 cells in psoriatic arthritis and psoriasis. Arthritis Res Ther 15:R136. (2011) Measurement and rates of persistence with and adherence to biologics for rheumatoid arthritis: a systematic review. Clin Ther 33:901–913. (2006) Anti-TNF antibody therapy in rheumatoid arthritis and the risk of serious infections and malignancies: systematic review and meta-analysis of rare harmful effects in randomized controlled trials. JAMA 295:2275–2285. (2008) Persistent clinical efficacy and safety of anti-tumour necrosis factor alpha therapy with infliximab in patients with ankylosing spondylitis over 5 years: evidence for different types of response. Ann Rheum Dis 67:340–345. (2005) Decreased incidence of anterior uveitis in patients with ankylosing spondylitis treated with the anti-tumor necrosis factor agents infliximab and etanercept. Arthritis Rheum 52:2447–2451. (1995) Use of immunohistologic and in situ hybridization techniques in the examination of sacroiliac joint biopsy specimens from patients with ankylosing spondylitis. Arthritis Rheum 38:499–505. (2002) Treatment of active ankylosing spondylitis with infliximab: a randomised controlled multicentre trial. Lancet 359:1187–1193. (2006) The PREMIER study: A multicenter, randomized, double-blind clinical trial of combination therapy with adalimumab plus methotrexate versus methotrexate alone or adalimumab alone in patients with early, aggressive rheumatoid arthritis who had not had previous methotrexate treatment. Arthritis Rheum 54:26–37. (1989) Inhibitory effect of TNF alpha antibodies on synovial cell interleukin-1 production in rheumatoid arthritis. Lancet 2:244–247. (1992) TNF alpha—a pivotal role in rheumatoid arthritis? Br J Rheumatol 31:293–298. (1998) Treatment of rheumatoid arthritis with recombinant human interleukin-1 receptor antagonist. Arthritis Rheum 41:2196–2204. (2014) Efficacy and safety of tocilizumab in patients with polyarticular-course juvenile idiopathic arthritis: results from a phase 3, randomised, double-blind withdrawal trial. Ann Rheum Dis 2014:16 Epub ahead of print. (2004) True infliximab resistance in rheumatoid arthritis: a role for lymphotoxin alpha? Ann Rheum Dis 63:1344–1346. (2011) Effectiveness and safety of the interleukin 6-receptor antagonist tocilizumab after 4 and 24 weeks in patients with active rheumatoid arthritis: the first phase IIIb real-life study (TAMARA). Ann Rheum Dis 70:755–759. (2014) A randomised, double-blind, parallel-group study of the safety and efficacy of subcutaneous tocilizumab versus intravenous tocilizumab in combination with traditional disease-modifying antirheumatic drugs in patients with moderate to severe rheumatoid arthritis (SUMMACTA study). Ann Rheum Dis 73:69–74. (2013) Efficacy and safety of mavrilimumab in subjects with rheumatoid arthritis. Ann Rheum Dis 72:1445–1452. (2012) Tocilizumab in patients with active rheumatoid arthritis and inadequate responses to DMARDs and/or TNF inhibitors: a large, open-label study close to clinical practice. Ann Rheum Dis 71:1950–1954. (2010) Osteoarthritis: can anti-cytokine therapy play a role in treatment? Clin Rheumatol 29:451–455. (2002) Pure red-cell aplasia and antierythropoietin antibodies in patients treated with recombinant erythropoietin. N Engl J Med 346:469–475. (2012) Systematic review: antibodies and anti-TNF-α levels in inflammatory bowel disease. Aliment Pharmacol Ther 35:971–986. (2014) Effectiveness of TNF inhibitor switch in RA: results from the national Swedish register. Ann Rheum Dis 2014:15 [Epub ahead of print]. (2013) Rituximab versus anti-TNF in patients who previously failed one TNF inhibitor in an observational cohort. Scand J Rheumatol 42:190–195. (2001) Elevated serum B lymphocyte stimulator levels in patients with systemic immune-based rheumatic diseases. Arthritis Rheum 44:1313–1319. (2006) A systematic review of the effectiveness of adalimumab, etanercept and infliximab for the treatment of rheumatoid arthritis in adults and an economic evaluation of their cost-effectiveness. Health Technol Assess 10:iii–iv, xi–xiii, 1–229. (2009) Intraarticular injection of anakinra in osteoarthritis of the knee: a multicenter, randomized, double-blind, placebo-controlled study. Arthritis Rheum 61:344–352. (2014) Adalimumab in patients with hand osteoarthritis refractory to analgesics and NSAIDs: a randomised, multicentre, double-blind, placebo-controlled trial. Ann Rheum Dis 2014:19 Epub ahead of print. (2004) The clinical and cost-effectiveness of anakinra for the treatment of rheumatoid arthritis in adults: a systematic review and economic analysis. Health Technol Assess 8:iii–iv, ix–x, 1–105. (2002) Treatment of rheumatoid arthritis with anakinra, a recombinant human interleukin-1 receptor antagonist, in combination with methotrexate: results of a twenty-four-week, multicenter, randomized, double-blind, placebo-controlled trial. Arthritis Rheum 46:614–624. (2004) A multicentre, double blind, randomised, placebo controlled trial of anakinra (Kineret), a recombinant interleukin 1 receptor antagonist, in patients with rheumatoid arthritis treated with background methotrexate. Ann Rheum Dis 63:1062–1068. (2010) Infliximab, azathioprine, or combination therapy for Crohn’s disease. N Engl J Med 362:1383–1395. (2007) Adalimumab for maintenance of clinical response and remission in patients with Crohn’s disease: the CHARM trial. Gastroenterology 132:52–65. (2013) Secukinumab failure in Crohn’s disease: the yeast connection? Gut 62:800–801. (2001) Blockade of collagen-induced arthritis post-onset by antibody to granulocyte-macrophage colony-stimulating factor (GM-CSF): requirement for GM-CSF in the effector phase of disease. Arthritis Res 3:293–298. (2013) Genome-wide association study and gene expression analysis identifies CD84 as a predictor of response to etanercept therapy in rheumatoid arthritis. PLoS Genet 9:e1003394. (2012) Factors associated with gastrointestinal perforation in a cohort of patients with rheumatoid arthritis. Arthritis Care Res (Hoboken) 64:1819–1828. (2014) Confirmation of -174G/C interleukin-6 gene promoter polymorphism as a genetic marker predicting antitumor necrosis factor treatment outcome. Pharmacogenet Genomics 24:1–5. (2003) Recombinant human tumor necrosis factor receptor (etanercept) for treating ankylosing spondylitis: a randomized, controlled trial. Arthritis Rheum 48:3230–3236. (1986) Human recombinant interleukin 1 stimulates collagenase and prostaglandin E2 production by human synovial cells. J Clin Invest 77:645–648. (2012) Randomized trial of tocilizumab in systemic juvenile idiopathic arthritis. N Engl J Med 367:2385–2395. (2014) A6: tapering and withdrawal of tocilizumab in patients with systemic juvenile idiopathic arthritis in inactive disease: results from an alternative dosing regimen in the TENDER study. Arthritis Rheum (Munch) 66 (Suppl 11):S8–S9. (1992) Localization of tumor necrosis factor receptors in the synovial tissue and cartilage-pannus junction in patients with rheumatoid arthritis. Implications for local actions of tumor necrosis factor alpha. Arthritis Rheum 35:1170–1178. (2012) Longitudinal model-based meta-analysis in rheumatoid arthritis: an application toward model-based drug development. Clin Pharmacol Ther 92:352–359. (2014) The concept of axial spondyloarthritis: joint statement of the spondyloarthritis research and treatment network and the Assessment of SpondyloArthritis international Society in response to the US Food and Drug Administration’s comments and concerns. Arthritis Rheum (Munch) 66:2649–2656. (1999) Endoscopic and histological healing with infliximab anti-tumor necrosis factor antibodies in Crohn’s disease: A European multicenter trial. Gastroenterology 116:1029–1034. (2006) An APRIL to remember: novel TNF ligands as therapeutic targets. Nat Rev Drug Discov 5:235–246. (2010) Drug-specific risk of tuberculosis in patients with rheumatoid arthritis treated with anti-TNF therapy: results from the British Society for Rheumatology Biologics Register (BSRBR). Ann Rheum Dis 69:522–528. (2006) Rates of serious infection, including site-specific and bacterial intracellular infection, in rheumatoid arthritis patients receiving anti-tumor necrosis factor therapy: results from the British Society for Rheumatology Biologics Register. Arthritis Rheum 54:2368–2376. (2002) Frequency of infection in patients with rheumatoid arthritis compared with controls: a population-based study. Arthritis Rheum 46:2287–2293. (2011) Efficacy of etanercept on rheumatic signs and pulmonary function tests in advanced ankylosing spondylitis: results of a randomised double-blind placebo-controlled study (SPINE). Ann Rheum Dis 70:799–804. (2013) Adding tocilizumab or switching to tocilizumab monotherapy in methotrexate inadequate responders: 24-week symptomatic and structural results of a 2-year randomised controlled strategy trial in rheumatoid arthritis (ACT-RAY). Ann Rheum Dis 72:43–50. (2009) Comparison of drug retention rates and causes of drug discontinuation between anti-tumor necrosis factor agents in rheumatoid arthritis. Arthritis Rheum 61:560–568. (2012) Differential drug retention between anti-TNF agents and alternative biological agents after inadequate response to an anti-TNF agent in rheumatoid arthritis patients. Ann Rheum Dis 71:997–999. (1993) Treatment of rheumatoid arthritis with chimeric monoclonal antibodies to tumor necrosis factor alpha. Arthritis Rheum 36:1681–1690. (2009) Less radiographic progression with adalimumab plus methotrexate versus methotrexate monotherapy across the spectrum of clinical response in early rheumatoid arthritis. J Rheumatol 36:1429–1441. (2014) Rituximab versus an alternative TNF inhibitor in patients with rheumatoid arthritis who failed to respond to a single previous TNF inhibitor: SWITCH-RA, a global, observational, comparative effectiveness study. Ann Rheum Dis 2014:29 Epub ahead of print. (2008) IL-6 receptor inhibition with tocilizumab improves treatment outcomes in patients with rheumatoid arthritis refractory to anti-tumour necrosis factor biologicals: results from a 24-week multicentre randomised placebo-controlled trial. Ann Rheum Dis 67:1516–1523. (2012) Differential risk of tuberculosis reactivation among anti-TNF therapies is due to drug binding kinetics and permeability. J Immunol 188:3169–3178. (1977) The effect of synovial tissue on the breakdown of articular cartilage in organ culture. Arthritis Rheum 20:1359–1371. (1993) The American College of Rheumatology preliminary core set of disease activity measures for rheumatoid arthritis clinical trials. Arthritis Rheum 36:729–740. (1995) American College of Rheumatology. Preliminary definition of improvement in rheumatoid arthritis. Arthritis Rheum 38:727–735. (2013) Direct and indirect comparison of the efficacy and safety of adalimumab, etanercept, infliximab and golimumab in psoriatic arthritis. J Clin Pharm Ther 38:286–293. (2008) Safety of anti-tumor necrosis factor-alpha therapy in patients with rheumatoid arthritis and chronic hepatitis C virus infection. J Rheumatol 35:1944–1949. (1992) [Plasma GM-CSF concentrations in rheumatoid arthritis, systemic lupus erythematosus and spondyloarthropathy]. Z Rheumatol 51:121–126. (2006) Inborn errors of IL-12/23- and IFN-gamma-mediated immunity: molecular, cellular, and clinical features. Semin Immunol 18:347–361. (2010) Which subgroup of patients with rheumatoid arthritis benefits from switching to rituximab versus alternative anti-tumour necrosis factor (TNF) agents after previous failure of an anti-TNF agent? Ann Rheum Dis 69:387–393. (2003) Anakinra, a recombinant human interleukin-1 receptor antagonist (r-metHuIL-1ra), in patients with rheumatoid arthritis: A large, international, multicenter, placebo-controlled trial. Arthritis Rheum 48:927–934. (2005) Risk of lymphoma in patients with RA treated with anti-TNFalpha agents. Ann Rheum Dis 64:657–658. (2012) Systematic literature review on economic implications and pharmacoeconomic issues of rheumatoid arthritis. Clin Exp Rheumatol 30(4, Suppl 73)S72–S84. (2004) Anakinra: review of recombinant human interleukin-I receptor antagonist in the treatment of rheumatoid arthritis. Clin Ther 26:1960–1975. (2006) Tumor necrosis factor antagonists: different kinetics and/or mechanisms of action may explain differences in the risk for developing granulomatous infection. Semin Arthritis Rheum 36:159–167. (2013a) Tocilizumab monotherapy versus adalimumab monotherapy for treatment of rheumatoid arthritis (ADACTA): a randomised, double-blind, controlled phase 4 trial. Lancet 381:1541–1550. (2013b) Tocilizumab versus adalimumab for rheumatoid arthritis - Authors’ reply. Lancet 382:395. (2011a) Anti-TNF therapy is associated with an increased risk of serious infections in patients with rheumatoid arthritis especially in the first 6 months of treatment: updated results from the British Society for Rheumatology Biologics Register with special emphasis on risks in the elderly. Rheumatology (Oxford) 50:124–131. (2011b) Risk of septic arthritis in patients with rheumatoid arthritis and the effect of anti-TNF therapy: results from the British Society for Rheumatology Biologics Register. Ann Rheum Dis 70:1810–1814. (2013) Risk of skin and soft tissue infections (including shingles) in patients exposed to anti-tumour necrosis factor therapy: results from the British Society for Rheumatology Biologics Register. Ann Rheum Dis 72:229–234. (2013) The immunogenicity of anti-TNF therapy in immune-mediated inflammatory diseases: a systematic review of the literature with a meta-analysis. Ann Rheum Dis 72:1947–1955. (2005) Epidemiology of psoriatic arthritis in the population of the United States. J Am Acad Dermatol 53:573–577. (2008) Interleukin-6 receptor inhibition with tocilizumab reduces disease activity in rheumatoid arthritis with inadequate response to disease-modifying antirheumatic drugs: the tocilizumab in combination with traditional disease-modifying antirheumatic drug therapy study. Arthritis Rheum 58:2968–2980. (2004) Combination therapy with etanercept and anakinra in the treatment of patients with rheumatoid arthritis who have been treated unsuccessfully with methotrexate. Arthritis Rheum 50:1412–1419. (2014a) One-year efficacy and safety results of secukinumab in patients with rheumatoid arthritis: phase II, dose-finding, double-blind, randomized, placebo-controlled study. J Rheumatol 41:414–421. (2013a) Efficacy and safety of secukinumab in patients with rheumatoid arthritis: a phase II, dose-finding, double-blind, randomised, placebo controlled study. Ann Rheum Dis 72:863–869. (2014b) A phase II randomized study of subcutaneous ixekizumab, an anti-interleukin-17 monoclonal antibody, in rheumatoid arthritis patients who were naive to biologic agents or had an inadequate response to tumor necrosis factor inhibitors. Arthritis Rheum (Munch) 66:1693–1704. (2011) Atacicept in patients with rheumatoid arthritis and an inadequate response to tumor necrosis factor antagonist therapy: results of a phase II, randomized, placebo-controlled, dose-finding trial. Arthritis Rheum 63:1793–1803. (2013b) Longterm safety and efficacy of tocilizumab in patients with rheumatoid arthritis: a cumulative analysis of up to 4.6 years of exposure. J Rheumatol 40:768–780. (2007) Adalimumab for long-term treatment of psoriatic arthritis: forty-eight week data from the adalimumab effectiveness in psoriatic arthritis trial. Arthritis Rheum 56:476–488. (2013) Clinical response, drug survival and predictors thereof in 432 ankylosing spondylitis patients after switching tumour necrosis factor α inhibitor therapy: results from the Danish nationwide DANBIO registry. Ann Rheum Dis 72:1149–1155. (2014) A novel human anti-interleukin-1β neutralizing monoclonal antibody showing in vivo efficacy. MAbs 6:765–773. (2006) Switching TNF antagonists in patients with chronic arthritis: an observational study of 488 patients over a four-year period. Arthritis Res Ther 8:R29. (2012) Comparative effectiveness of switching to alternative tumour necrosis factor (TNF) antagonists versus switching to rituximab in patients with rheumatoid arthritis who failed previous TNF antagonists: the MIRAR Study. Ann Rheum Dis 71:1861–1864. (2009) Ustekinumab, a human interleukin 12/23 monoclonal antibody, for psoriatic arthritis: randomised, double-blind, placebo-controlled, crossover trial. Lancet 373:633–640. (2010) Similar effects of disease-modifying antirheumatic drugs, glucocorticoids, and biologic agents on radiographic progression in rheumatoid arthritis: meta-analysis of 70 randomized placebo-controlled or drug-controlled studies, including 112 comparisons. Arthritis Rheum 62:2852–2863. (2010) Association of methotrexate and tumour necrosis factor antagonists with risk of infectious outcomes including opportunistic infections in the CORRONA registry. Ann Rheum Dis 69:380–386. (1993) Incidence of cancer among patients with rheumatoid arthritis. J Natl Cancer Inst 85:307–311. (2011) Initiation of tumor necrosis factor-α antagonists and the risk of hospitalization for infection in patients with autoimmune diseases. JAMA 306:2331–2339. (2010) Comparison of ustekinumab and etanercept for moderate-to-severe psoriasis. N Engl J Med 362:118–128. (2002) Maintenance infliximab for Crohn’s disease: the ACCENT I randomised trial. Lancet 359:1541–1549. (2006) Human anti-tumor necrosis factor monoclonal antibody (adalimumab) in Crohn’s disease: the CLASSIC-I trial. Gastroenterology 130:323–333, quiz 591. (2013) High prevalence of psoriatic arthritis in patients with severe psoriasis with suboptimal performance of screening questionnaires. Ann Rheum Dis 72:736–740. (2007) Prevalence and complications of uveitis in juvenile idiopathic arthritis in a population-based nation-wide study in Germany: suggested modification of the current screening guidelines. Rheumatology (Oxford) 46:1015–1019. (2011) The European ankylosing spondylitis infliximab cohort (EASIC): a European multicentre study of long term outcomes in patients with ankylosing spondylitis treated with infliximab. Clin Exp Rheumatol 29:672–680. (2010) Direct comparison of treatment responses, remission rates, and drug adherence in patients with rheumatoid arthritis treated with adalimumab, etanercept, or infliximab: results from eight years of surveillance of clinical practice in the nationwide Danish DANBIO registry. Arthritis Rheum 62:22–32. (2014) Efficacy and safety of open-label etanercept on extended oligoarticular juvenile idiopathic arthritis, enthesitis-related arthritis and psoriatic arthritis: part 1 (week 12) of the CLIPPER study. Ann Rheum Dis 73:1114–1122. (2012) Long-term treatment with infliximab in patients with sarcoidosis. Respiration 83:218–224. (2010) Effects of AIN457, a fully human antibody to interleukin-17A, on psoriasis, rheumatoid arthritis, and uveitis. Sci Transl Med 2:52ra72. (2012) Secukinumab, a human anti-IL-17A monoclonal antibody, for moderate to severe Crohn’s disease: unexpected results of a randomised, double-blind placebo-controlled trial. Gut 61:1693–1700. (2014) Sarilumab, a fully human monoclonal antibody against IL-6Rα in patients with rheumatoid arthritis and an inadequate response to methotrexate: efficacy and safety results from the randomised SARIL-RA-MOBILITY Part A trial. Ann Rheum Dis 73:1626–1634. (2007) Outcomes after switching from one anti-tumor necrosis factor alpha agent to a second anti-tumor necrosis factor alpha agent in patients with rheumatoid arthritis: results from a large UK national cohort study. Arthritis Rheum 56:13–20. (2006) Predictors of response to anti-TNF-alpha therapy among patients with rheumatoid arthritis: results from the British Society for Rheumatology Biologics Register. Rheumatology (Oxford) 45:1558–1565. (2012) Longterm retention of tumor necrosis factor-α inhibitor therapy in a large italian cohort of patients with rheumatoid arthritis from the GISEA registry: an appraisal of predictors. J Rheumatol 39:1179–1184. (2012) Safety and efficacy of tocilizumab, an anti-IL-6-receptor monoclonal antibody, in patients with polyarticular-course juvenile idiopathic arthritis. Mod Rheumatol 22:109–115. (2008) Efficacy and safety of golimumab in patients with ankylosing spondylitis: results of a randomized, double-blind, placebo-controlled, phase III trial. Arthritis Rheum 58:3402–3412. (2010) A double-blind, placebo-controlled trial of low dose infliximab in ankylosing spondylitis. J Rheumatol 37:1203–1210. (2011) The presence or absence of antibodies to infliximab or adalimumab determines the outcome of switching to etanercept. Ann Rheum Dis 70:284–288. (2010) Comparison of tocilizumab monotherapy versus methotrexate monotherapy in patients with moderate to severe rheumatoid arthritis: the AMBITION study. Ann Rheum Dis 69:88–96. (2012) Role of interleukin-1 inhibitors in osteoarthritis: an evidence-based review. Drugs Aging 29:343–358. (2013) Importance of reverse signaling of the TNF superfamily in immune regulation. Expert Rev Clin Immunol 9:335–348. (2009) Golimumab, a new human tumor necrosis factor alpha antibody, administered every four weeks as a subcutaneous injection in psoriatic arthritis: Twenty-four-week efficacy and safety results of a randomized, placebo-controlled study. Arthritis Rheum 60:976–986. (2014) Ustekinumab, an anti-IL-12/23 p40 monoclonal antibody, inhibits radiographic progression in patients with active psoriatic arthritis: results of an integrated analysis of radiographic data from the phase 3, multicentre, randomised, double-blind, placebo-controlled PSUMMIT-1 and PSUMMIT-2 trials. Ann Rheum Dis 73:1000–1006. (2001) Tuberculosis associated with infliximab, a tumor necrosis factor alpha-neutralizing agent. N Engl J Med 345:1098–1104. (2012) Rituximab is more effective than second anti-TNF therapy in rheumatoid arthritis patients and previous TNFα blocker failure. Biologics 6:191–199. (2008) Certolizumab pegol plus methotrexate is significantly more effective than placebo plus methotrexate in active rheumatoid arthritis: findings of a fifty-two-week, phase III, multicenter, randomized, double-blind, placebo-controlled, parallel-group study. Arthritis Rheum 58:3319–3329. (2009) Golimumab, a human antibody to tumour necrosis factor alpha given by monthly subcutaneous injections, in active rheumatoid arthritis despite methotrexate therapy: the GO-FORWARD Study. Ann Rheum Dis 68:789–796. (2004) Effect of different tumor necrosis factor (TNF) reactive agents on reverse signaling of membrane integrated TNF in monocytes. Cytokine 28:67–74. (2011) Assessment of long-term safety and efficacy of etanercept in a 5-year extension study in patients with rheumatoid arthritis. Clin Exp Rheumatol 29:238–247. (2004) Therapeutic effect of the combination of etanercept and methotrexate compared with each treatment alone in patients with rheumatoid arthritis: double-blind randomised controlled trial. Lancet 363:675–681. (2009) Leukoencephalopathy with cognitive impairment following tocilizumab for the treatment of rheumatoid arthritis (RA). Intern Med 48:1307–1309. (2011) Postmarketing surveillance of tocilizumab for rheumatoid arthritis in Japan: interim analysis of 3881 patients. Ann Rheum Dis 70:2148–2151. (2011) Tocilizumab inhibits structural joint damage in rheumatoid arthritis patients with inadequate responses to methotrexate: results from the double-blind treatment phase of a randomized placebo-controlled trial of tocilizumab safety and prevention of structural joint damage at one year. Arthritis Rheum 63:609–621. (2008) Predictors of response to anti-TNF therapy according to ACR and EULAR criteria in patients with established RA: results from the South Swedish Arthritis Treatment Group Register. Rheumatology (Oxford) 47:495–499. (2007) A human interleukin-12/23 monoclonal antibody for the treatment of psoriasis. N Engl J Med 356:580–592. (2013) A phase I, open-label study of siltuximab, an anti-IL-6 monoclonal antibody, in patients with B-cell non-Hodgkin lymphoma, multiple myeloma, or Castleman disease. Clin Cancer Res 19:3659–3670. (2014) Efficacy of certolizumab pegol on signs and symptoms of axial spondyloarthritis including ankylosing spondylitis: 24-week results of a double-blind randomised placebo-controlled Phase 3 study. Ann Rheum Dis 73:39–47. (2006) Disconnect between inflammation and joint destruction after treatment with etanercept plus methotrexate: results from the trial of etanercept and methotrexate with radiographic and patient outcomes. Arthritis Rheum 54:3119–3125. (2009) Utilization trends of tumor necrosis factor inhibitors among patients with rheumatoid arthritis in a United States observational cohort study. J Rheumatol 36:1611–1617. (2009) The safety of anti-tumour necrosis factor treatments in rheumatoid arthritis: meta and exposure-adjusted pooled analyses of serious adverse events. Ann Rheum Dis 68:1136–1145. (2012) Anti-interleukin-17 monoclonal antibody ixekizumab in chronic plaque psoriasis. N Engl J Med 366:1190–1199. (2008) Efficacy and safety of ustekinumab, a human interleukin-12/23 monoclonal antibody, in patients with psoriasis: 76-week results from a randomised, double-blind, placebo-controlled trial (PHOENIX 1). Lancet 371:1665–1674. (2003) Etanercept as monotherapy in patients with psoriasis. N Engl J Med 349:2014–2022. (2011) Effectiveness of switching between TNF inhibitors in ankylosing spondylitis: data from the NOR-DMARD register. Ann Rheum Dis 70:157–163. (2008) Adalimumab with or without methotrexate in juvenile rheumatoid arthritis. N Engl J Med 359:810–820. (2013) Treatment of ankylosing spondylitis with TNF blockers: a meta-analysis. Rheumatol Int 33:2199–2213. (2007) A pilot study of tumor necrosis factor inhibition in erosive/inflammatory osteoarthritis of the hands. J Rheumatol 34:1323–1327. (1999) Infliximab (chimeric anti-tumour necrosis factor alpha monoclonal antibody) versus placebo in rheumatoid arthritis patients receiving concomitant methotrexate: a randomised phase III trial. Lancet 354:1932–1939. (2006) Double-blind randomized controlled clinical trial of the interleukin-6 receptor antagonist, tocilizumab, in European patients with rheumatoid arthritis who had an incomplete response to methotrexate. Arthritis Rheum 54:2817–2829. (2011) Adalimumab, etanercept, infliximab, rituximab and abatacept for the treatment of rheumatoid arthritis after the failure of a tumour necrosis factor inhibitor: a systematic review and economic evaluation. Health Technol Assess 15:1–278. (2011) Malignancies associated with tumour necrosis factor inhibitors in registries and prospective observational studies: a systematic review and meta-analysis. Ann Rheum Dis 70:1895–1904. (2012) Updated meta-analysis of non-melanoma skin cancer rates reported from prospective observational studies in patients treated with tumour necrosis factor inhibitors. Ann Rheum Dis 71:e2. (2013) A phase Ib multiple ascending dose study evaluating safety, pharmacokinetics, and early clinical response of brodalumab, a human anti-IL-17R antibody, in methotrexate-resistant rheumatoid arthritis. Arthritis Res Ther 15:R164. (2013) Efficacy and safety of ustekinumab in patients with active psoriatic arthritis: 1 year results of the phase 3, multicentre, double-blind, placebo-controlled PSUMMIT 1 trial. Lancet 382:780–789. (2014) Efficacy and safety of secukinumab, a fully human anti-interleukin-17A monoclonal antibody, in patients with moderate-to-severe psoriatic arthritis: a 24-week, randomised, double-blind, placebo-controlled, phase II proof-of-concept trial. Ann Rheum Dis 73:349–356. (2014a) Effect of certolizumab pegol on signs and symptoms in patients with psoriatic arthritis: 24-week results of a Phase 3 double-blind randomised placebo-controlled study (RAPID-PsA). Ann Rheum Dis 73:48–55. (2014b) Brodalumab, an anti-IL17RA monoclonal antibody, in psoriatic arthritis. N Engl J Med 370:2295–2306. (2005) Adalimumab for the treatment of patients with moderately to severely active psoriatic arthritis: results of a double-blind, randomized, placebo-controlled trial. Arthritis Rheum 52:3279–3289. (2004) Etanercept treatment of psoriatic arthritis: safety, efficacy, and effect on disease progression. Arthritis Rheum 50:2264–2272. (2007) A randomized comparison of continuous vs. intermittent infliximab maintenance regimens over 1 year in the treatment of moderate-to-severe plaque psoriasis. J Am Acad Dermatol 56:e1–e15. (2008) Adalimumab therapy for moderate to severe psoriasis: A randomized, controlled phase III trial. J Am Acad Dermatol 58:106–115. (2013) Risk of cancer in patients receiving non-biologic disease-modifying therapy for rheumatoid arthritis compared with the UK general population. Rheumatology (Oxford) 52:91–98. (2011) Therapeutic drug monitoring of infliximab in spondyloarthritis: an observational open-label study. Ther Drug Monit 33:411–416. (2009) Anakinra for rheumatoid arthritis. Cochrane Database Syst Rev (1):CD005121. (2012) Targeting IL-17 and TH17 cells in chronic inflammation. Nat Rev Drug Discov 11:763–776. (2014) Long-term treatment with golimumab for severe uveitis. Ocul Immunol Inflamm 22:90–95. (2014) Development of pulmonary and cardiac sarcoidosis during etanercept therapy. Int J Rheum Dis 17:810–812. (2013) Infliximab dose reduction sustains the clinical treatment effect in active HLAB27 positive ankylosing spondylitis: a two-year pilot study. Mediators Inflamm 2013:289845. (1999) Etanercept therapy in rheumatoid arthritis. A randomized, controlled trial. Ann Intern Med 130:478–486. (1993) Location of tumour necrosis factor alpha by immunohistochemistry in chronic inflammatory bowel disease. Gut 34:1705–1709. (2010) Current evidence for the management of rheumatoid arthritis with biological disease-modifying antirheumatic drugs: a systematic literature review informing the EULAR recommendations for the management of RA. Ann Rheum Dis 69:976–986. (2014) Efficacy of biological disease-modifying antirheumatic drugs: a systematic literature review informing the 2013 update of the EULAR recommendations for the management of rheumatoid arthritis. Ann Rheum Dis 73:516–528. (2011) Low doses of etanercept can be effective in ankylosing spondylitis patients who achieve remission of the disease. Clin Rheumatol 30:993–996. (2005) Adalimumab for treating rheumatoid arthritis. Cochrane Database Syst Rev (3):CD005113. (2007) Mechanism of action of certolizumab pegol (CDP870): in vitro comparison with other anti-tumor necrosis factor alpha agents. Inflamm Bowel Dis 13:1323–1332. (2007) Study of active controlled monotherapy used for rheumatoid arthritis, an IL-6 inhibitor (SAMURAI): evidence of clinical and radiographic benefit from an x ray reader-blinded randomised controlled trial of tocilizumab. Ann Rheum Dis 66:1162–1167. (2014a) Drug free REmission/low disease activity after cessation of tocilizumab (Actemra) Monotherapy (DREAM) study. Mod Rheumatol 24:17–25.